In today’s article we’re going to be reviewing 100 of the best watches available for under £500. There’s something here for everyone, from classic Swiss timepieces to affordable digital models. You’ll spot lots of popular brands such as Citizen, Bulova, Tissot, Timex, Armani and Hugo Boss with tons of other brands thrown in as well. If you’re looking to buy an affordable watch under £500, we’ve got you covered. As much as it took me a few days to put this together I did have a fun time looking through and researching about all the watches. Normally I’d select a favourite but there truly are far too many for me to pick from. Why don’t you let me know your favourite in the comments section below? 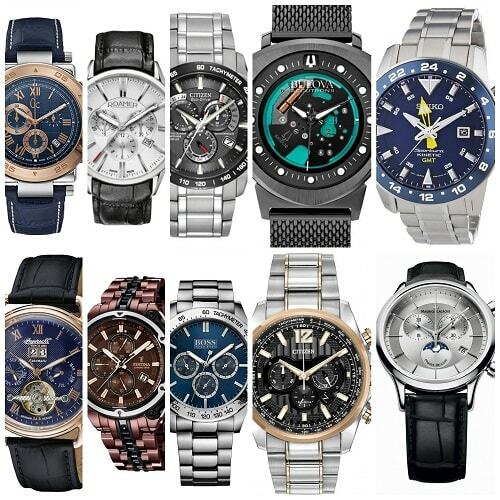 Many of these watches are from brands featured in our top 10 best watch brands for men and 10 most affordable Swiss watch brands. Anyway, I’ll let you get to it, you’ve got 100 watches to take a peek at. Enjoy! To view an up to date price for any of the watches just click through on their top link for full specifications and details. 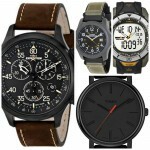 Best watches under £500 2019 – Updated 23rd January 2019 added new watches and updated details. This first watch to be features in our list of the best watches under £500 is this awesome Citizen Navihawk. The Navihawk is a high end, high performance watch from Citizen. 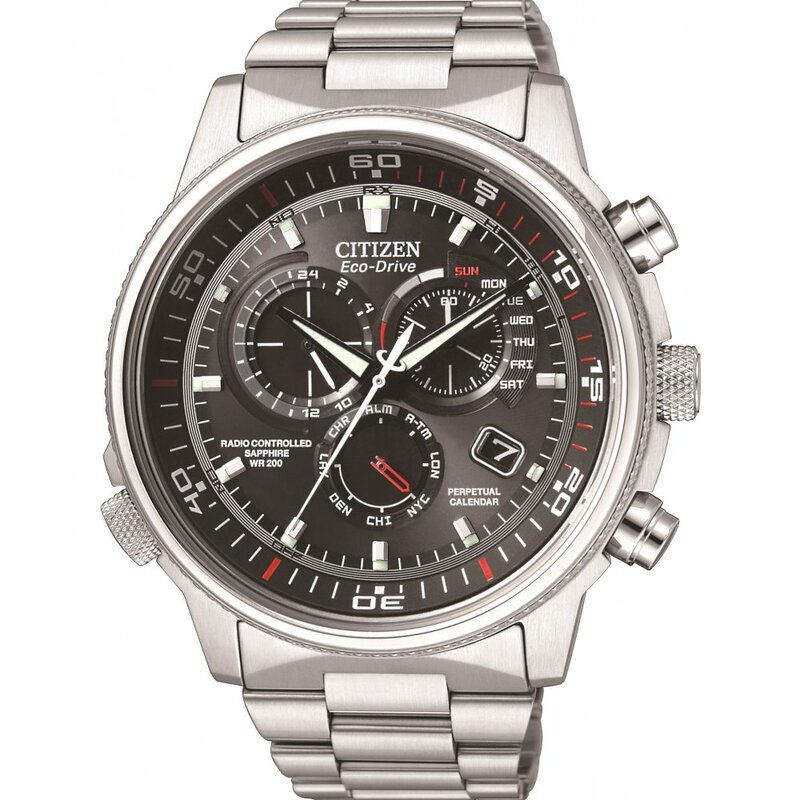 It runs on Citizen’s Eco-Drive technology which mean’s it’s powered by light and never requires a battery. The watch is also very accurate due to the radio controlled atomic timekeeping, this means the watch sychronises with an atomic clock availble in cities around the world. It has a large 48mm casing diameter which is sure to suit those who prefer oversized watches too. It’s packed full of useful features such as a chronograph, alarm, perpetual calendar, 200m water resistance rating and more . 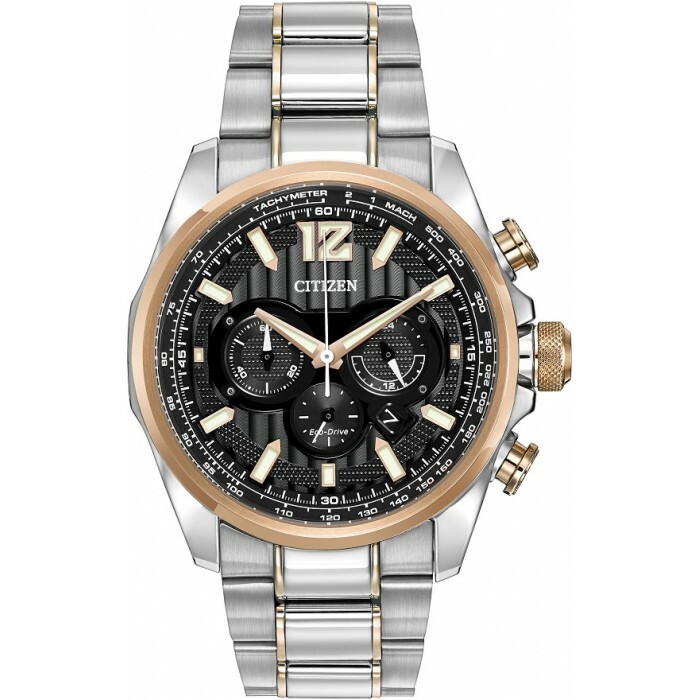 One of the most popular best selling Citizen watches for under £500 is this Chrono Perpetual chronograph watch. I love the detailing on the inner part of the dial on this watch, it adds an extra aspect that improves the overall design in my opinion. Like the previous watch this model also harnesses Citizen’s Eco-Drive technology meaning this watch is powered by light and never needs a battery change. The perpetual calendar AT model is radio controlled making it very accurate and it comes fully loaded with great features. These features include a high quality sapphire crystal glass for ultimate scratch resistance, chronograph display, dual time, tacymete, and a 200m water resistance rating. Honestly, it’s well worth checking out the full specifications on this model. 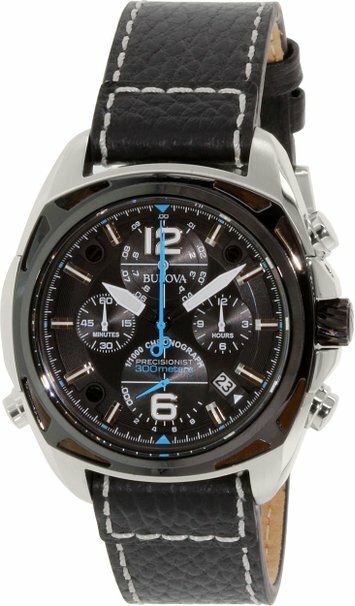 When it comes to luxury Bulova watches it’s well worth checking out this Bulova Precisionist Champlain chronograph watch. The precisionist series have ultra accurate movements that vibrate up to eight times greater than a standard watch, this 262 kHz frequency gives the seconds hand a smooth sweeping hand. The chronograph is also very impressive timing to 1/1000th of a second with a 12 hour total trackable. 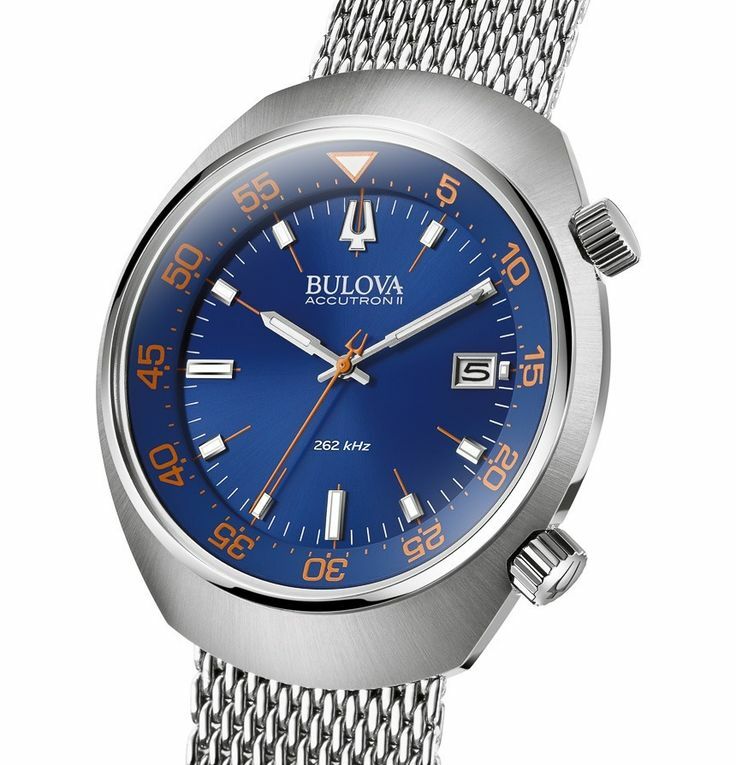 This incredible Bulova watch is housed in a sold stainless steel case that has a screw down case back and crown, allowing it to sport a brilliant 300m water resistance rating. I’m also very pleased with the curved sapphire crystal glass, a great extra feature in my eyes. 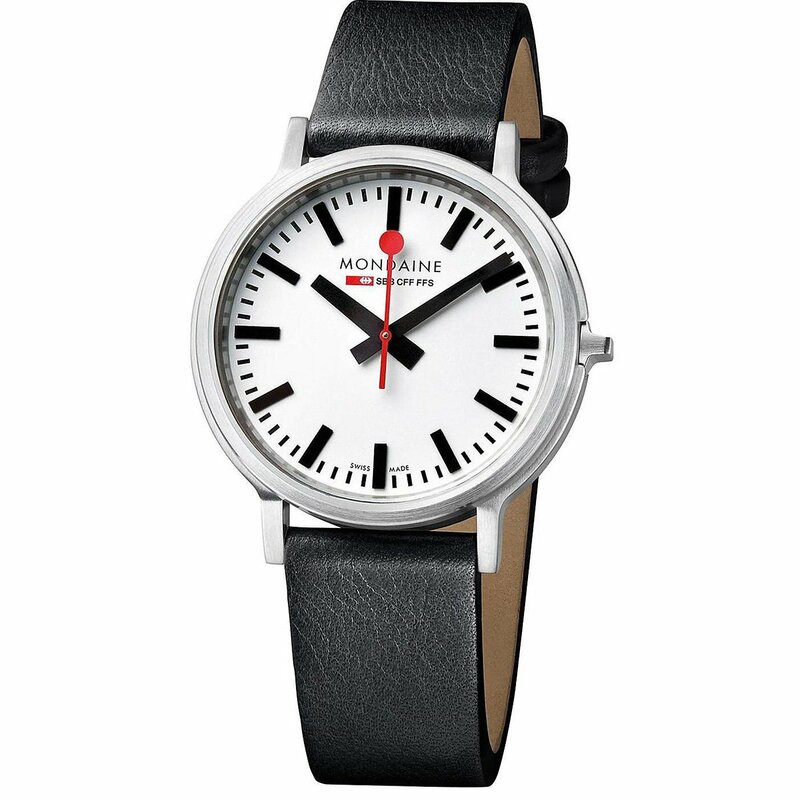 I’ve been a massive fan of Mondaine’s watches for some time now. I love this homage to the Swiss Railways clocks. This watch features a specifically designed Swiss quartz movement, the second-hand runs slightly fast for 58 seconds, gets to the 12 o’clock mark, waits 2 seconds, before then resuming. The movement matches the operation of the railway clocks. The watch also features that iconic Mondaine white with thick black baton markers and hands along with the defining red second hand. The watch also has fantastic scratch resistance due to its sapphire crystal glass. A very unique watch under £500. 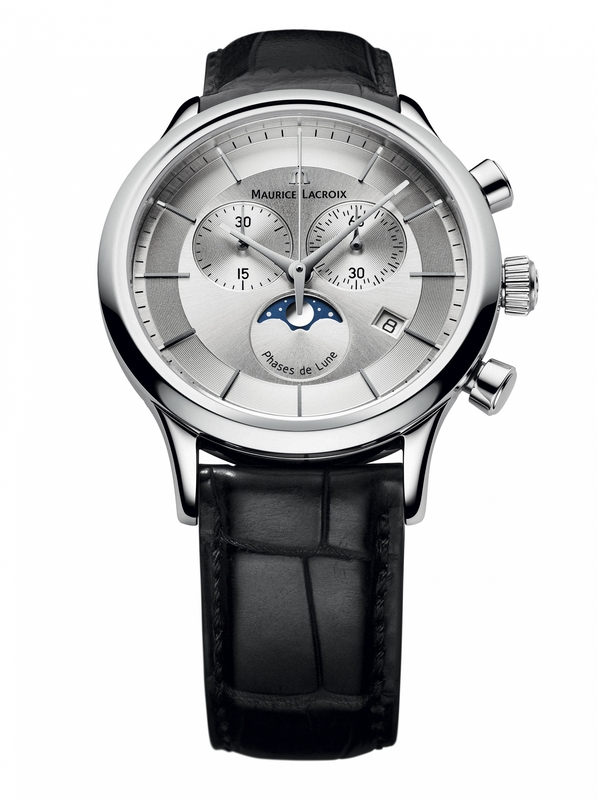 Next up we have this beautiful Maurice Lacroix Swiss made watch. The dial design is truly beautiful with the 2 chronograph sub dials side by side with a moon phase dial below. Being a high end Swiss watch it features a quality Swiss quartz movement for accurate reliable timekeeping, as well as a sapphire crystal glass for top scratch resistance. The only specification I feel is lacking a bit is the water resistance rating at a mere 30m, obviously, it depends what you need your watch for day to day as to whether that’s an issue or not. The attractive looking gents Festina watch is a 2015 limited edition. The Festina Chrono Bike has this stunning PVD rose plating that really makes it stand out, the colour really is a bit different from most watches I’ve had the pleasure of seeing. 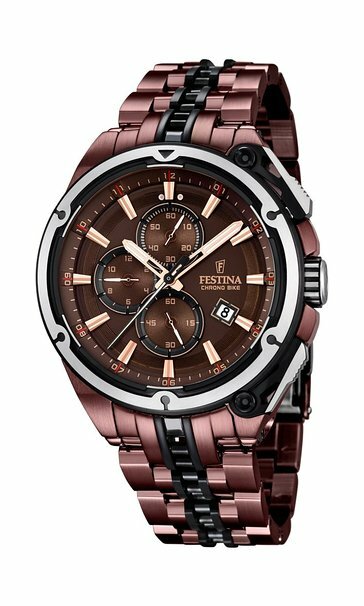 It’s built to a superb quality as you’d expect from Festina, there are chronograph sub dials on the main dial and I love the rose gold detailing too. 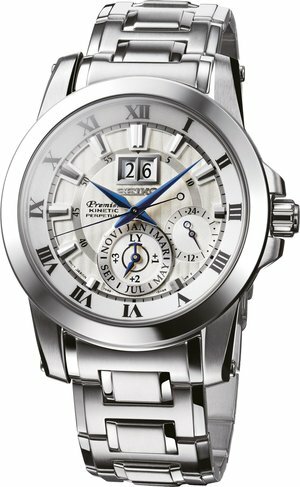 The watch itself is powered by a reliable Japanese quartz movement and has an impressive 100m water resistance rating. 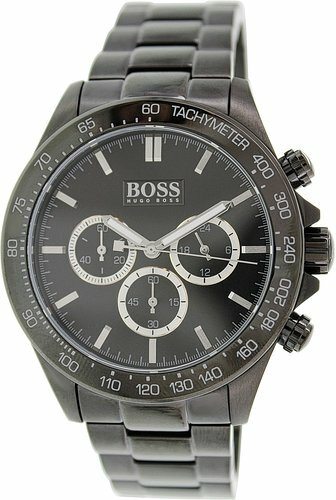 This is the first Hugo Boss watch I’m featuring today, they’re actually one of my favourite designer brands. The Hugo Boss Ikon has this brilliant large chronograph display. It runs off a chronograph quartz movement and has a decent 100m water resistance rating. I really like the look of the blue dial on the timepiece, it just works really well. Overall a lovely watches that’s not too big, nor too heavy. 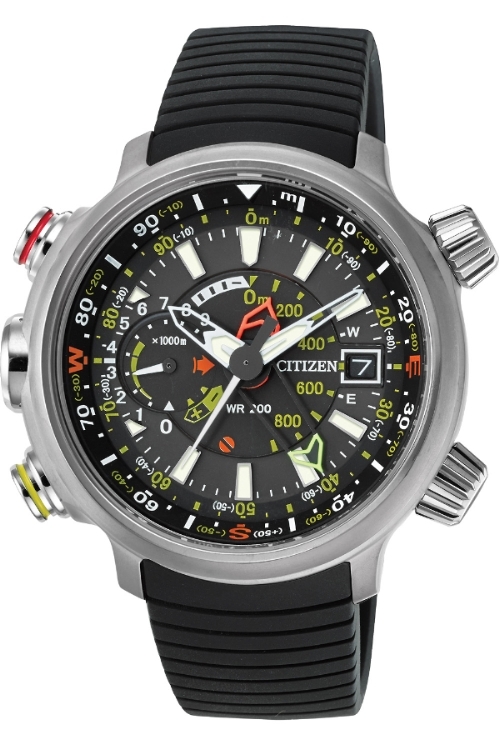 The Citizen Skyhawk series are highly function watches often available for under £500. The watch is extremely accurate due to being radio controlled and synchronizing up to atomic clocks around the world. The watch features a GMT display as well as a power reserve indicator which are handy features. Overall I’d consider it an oversized watch with the 46mm casing diameter, so if you’re not a fan of large watches, then this one might not be ideal for you. The last feature I wanted to point out was the Eco-Drive technology, this means the watch is powered by light and never requires a battery. 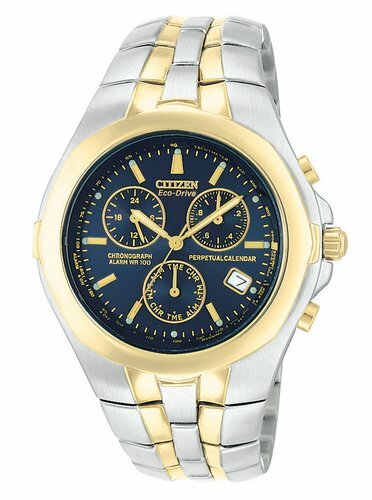 Next up is another popular radio controlled watch from Citizen. Again, highly functional with a very impressive accuracy rating due to it synchronizing with atomic clocks available in many time zones. The superior accuracy and Eco-Drive technology set this watch apart from many other watches under £500. When it comes to looking at the best chronograph watch under £500, this Roam of Switzerland watch is definitely a contender in my eyes. I love the detailing you get with chronograph watches, the extra sub dials add something extra to the design which is great. 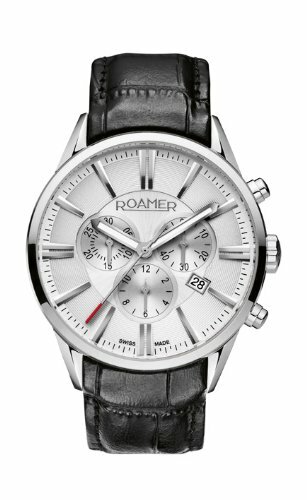 This chronograph watch from Roamer is Swiss made and of course, features a quality Swiss quartz movement. I like the use of high visibility watch hands that are coated with lume for that easier reading at night. 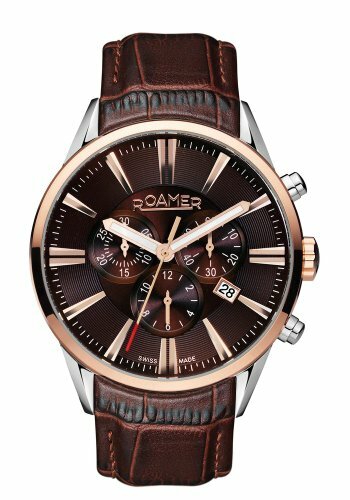 This Roamer watch also has a decent sapphire crystal glass as well as a 50m water resistance rating, offering a great watch that offers value for money. Next up we have a brilliant ceramic automatic watch from Davosa. This is a best seller for Davosa, a brand I’m quite fond of. I’d place this as one of my best diver’s watches under £500, it has this brilliant Rolex homage style to it which a lot of people will love. 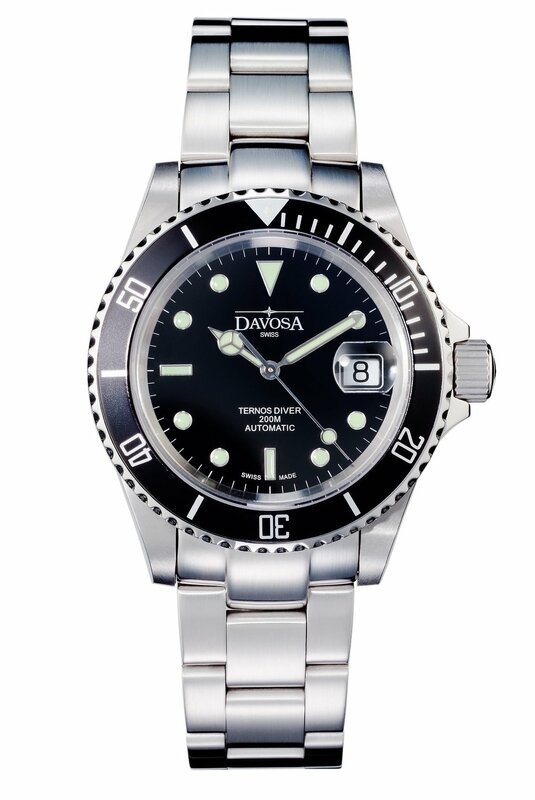 The Davosa Ternos Diver also has some pretty good specifications though. It runs on a Swiss ETA 2824-2 automatic movement that’s a fan favourite among collectors, it’s a 25 jewel movement with an impressive 42 hour power reserve. The watch also has a screw down crown and caseback to go with the 200m water resistance rating, exactly what you’d expect from any serious dive watch. Following along with the dive watch design is the dial, it has an easy to read high visibility finish to it with the watch hands and hour markers coated in a good amount of lume. The last thing I wanted to point out the stainless steel bracelet that has a fold over deployment style clasp, with the added diver’s extension for when you’re wearing it with a wetsuit. 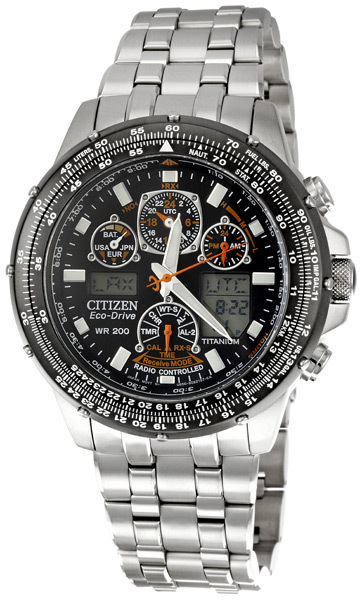 Next up we have another popular watch from citizen, the Nighthawk A-T watch. 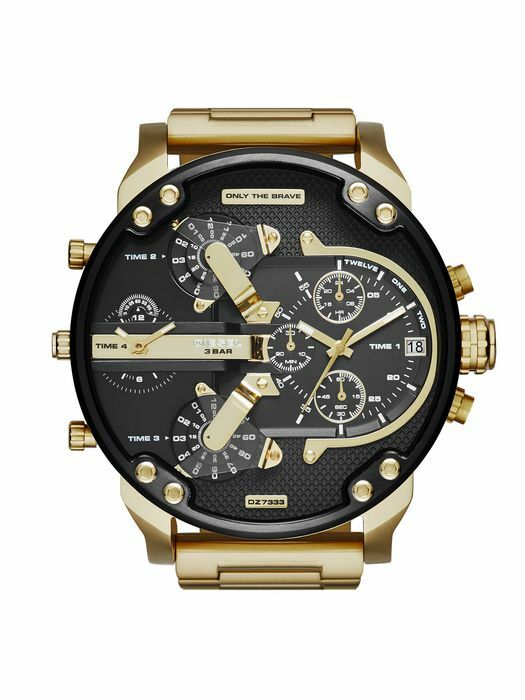 This chronograph watch uses atomic timekeeping to stay extremely accurate via radio control. The watch features a perpetual calendar meaning the date doesn’t have to be adjusted for the varying amount of days in each month either. Another brilliant feature is the Eco-Drive tech that I’ve mentioned on the previous watches, it powers the watch using light, be it artificial or natural and never requires a battery change. It’s an oversiex watch at 49mm and a 19mm thickness making it quite a chunky timepiece. The watch also makes use of a sapphire crystal glass and 200m water resistance rating. 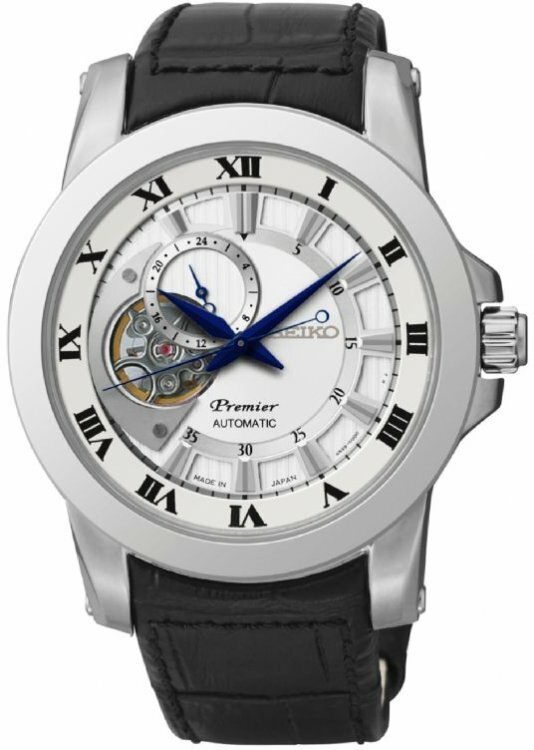 This is another one of the best automatic watches under £500 in my opinion. 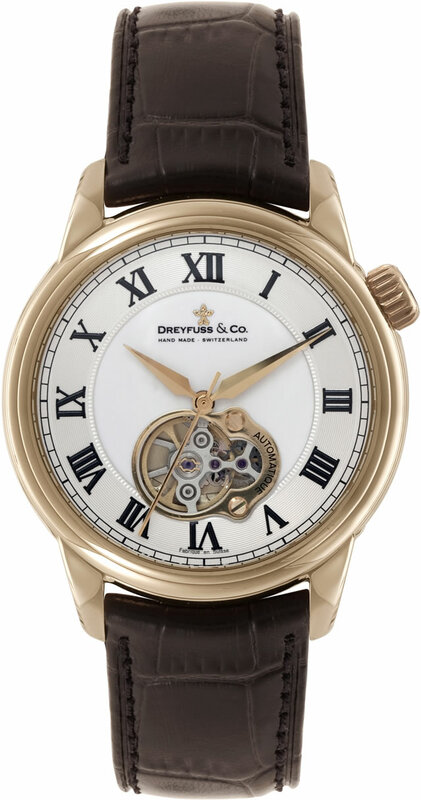 Dreyfuss Co make some truly luxrious watches, I love the design of this model. A key feature of the dial is the semi exposed mechanism adding in a bit of skeleton watch design. The movement on show is a Swiss made automatic with the balance wheel display. The PVD rose gold plating of the stainless steel casing blends nicely with the dark tan genuine leather strap too. I like the off-set position of the push down crown too, not something you see every day. 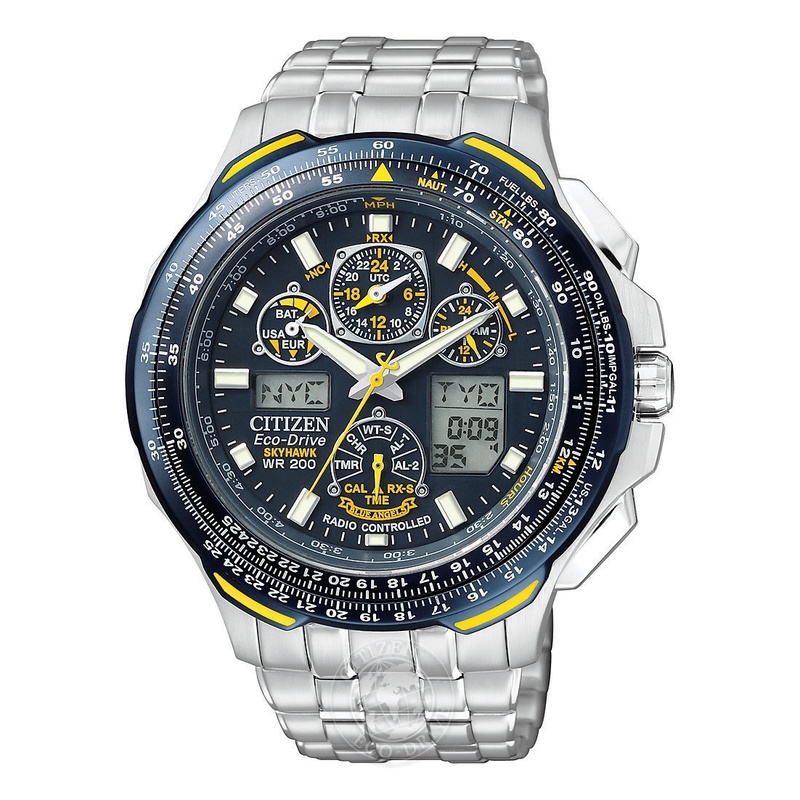 In the past I’ve done many Citizen watch reviews and I’ve always remained very impressive with their Skyhawk series. 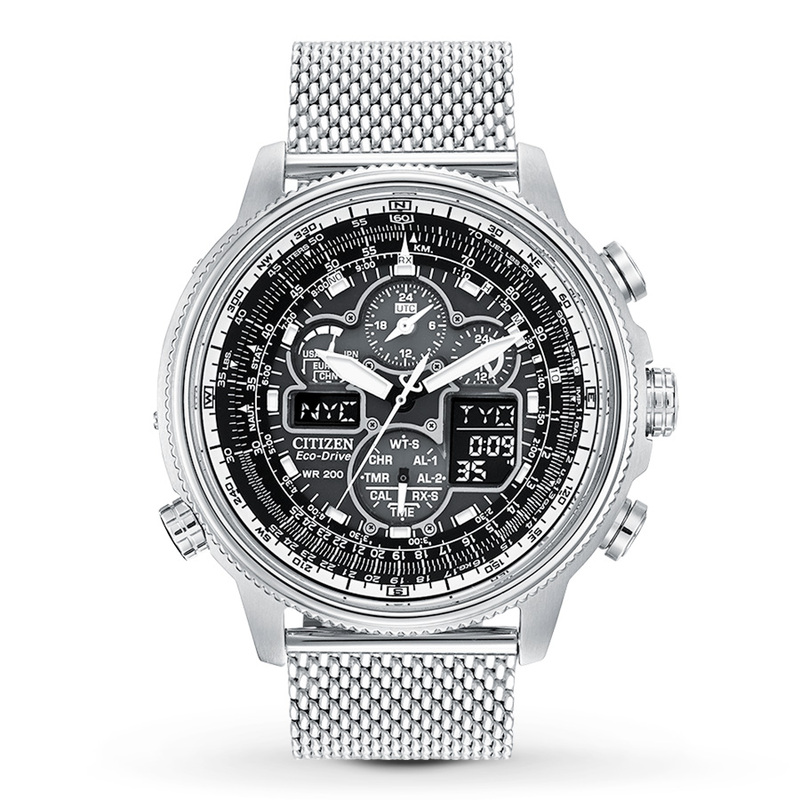 The Citizen Skyhawk is a radio controlled watch that syncronises with an atomic clock for unparralled timekeeping. It’s full of plenty of features such as a countdown timer, crhonograph, world time display, perpetual calendar, and 200m water resistance rating. The rotating slide rule bezel ensures this is one of the best pilot watches under £500 for any situation. When you also take into account the Eco-Drive system and the power reserve indicator, it’s one hell of a watch. To insure that it’s suitable for pilots this watch also has a high visibility display with a strong luminous coating on the hands and hour markers, as well as a backlight for the LCD screen. An incredible watch for the price that’s for sure. This next fashionable wristwatch is made by Luminox. From the Field Day Date 1920 series this series of watches commemorates the military field watches that gained popularity during WW1. 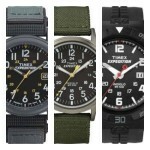 Luminox are one of the best Swiss watch brands when it comes to self-powered watch illumination. All Luminox watches feature these tiny micro gas light sources which give the watch unsurpassed visibility in the dark. This is one of my favourite modern field watches, I love the design of the dial with high visibility in mind and the use of the bold numerals around the edge. It runs on a Swiss quartz movement and also features a sapphire crystal glass, overall, a very cool watch that’s ideal for those looking for a high end affordable Swiss watch. Here we have a fairly affordable watch from Jorg Gray. This is a Obama Commemorative Edition chronograph watch. Each watch has an idividual seris number on the case back that shows the commemorative edition information. The watch has a high precision quartz movement and a 100m water resistance rating. It’s a little hard to see from this main picture but the watch also features a buffalo grain italian leather strap with white stitching. 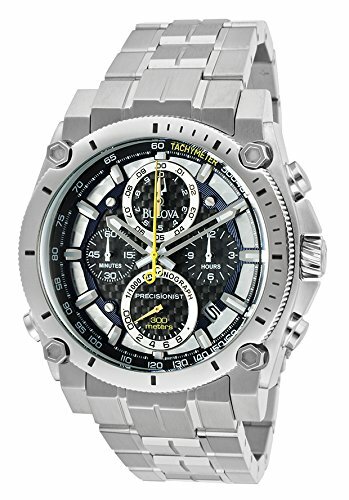 Again we’re featuring another on of Bulova Precisionist watches. It’s definitely an oversized watch with a 50mm casing diameter and 18mm thickness, so if you like chunky watches, this may be well up your street. The Bulova watch has all the high end specifications we’ve come to expect from the Precisionist series. The UHF movement is accurate to within 10 seconds per year and beating at 262 khz gives you this brilliant sweeping seconds hand movement. The screw down crown and case back are great editions for this 300m water resistance rated watch too. The watch also has a curved crystal to show off the carbon fibre face of the dial which works out very nicely. 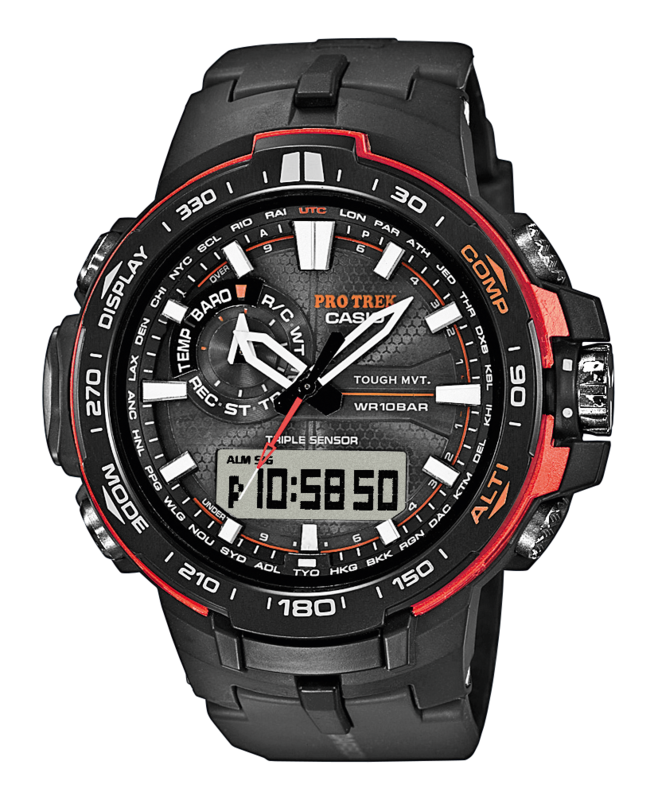 For those after a serious outdoor watch Casio’s Pro Trek series should really be considered. This serious be of kit is full of features with its smart access technology and radio signal reception. This watch features a barometer, altimeter, themometer, digital compass, and a radio signal receiver so it’s ideal for most adventurers. A key feature of the watch is its Tough Solar technology, this means the watch is charged by light and never needs a battery. There’s actually so many features on this watch it would be silly to just list them all, if you like the look of the watch and the features mentioned so far, defintely look it up and find out everything it has to offer. Next up we have a very popular diver watch under £500. This Seiko Prospex Diver is a great choice for those that need a high level of water resistance and love that typical dive watch style. The Seiko Prospex has a Diver’s 200m water resistance rating making it ISO certified and suitable for most diver’s needs. 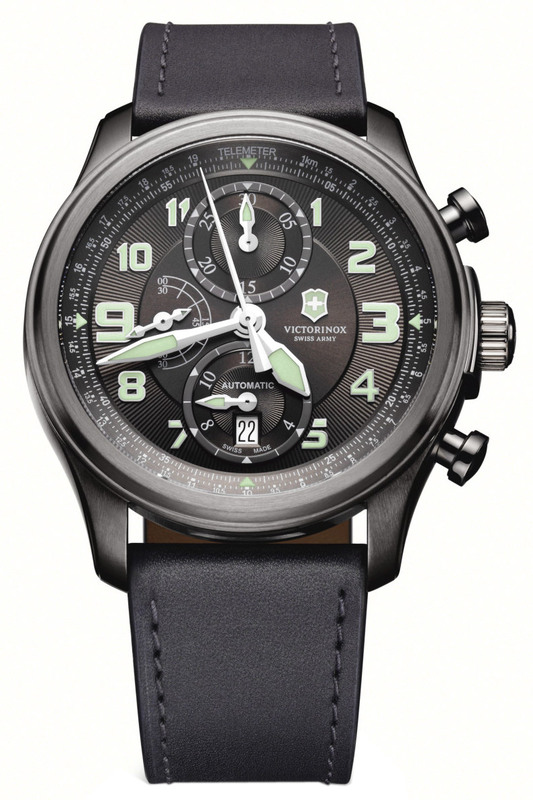 It’s fitted with a chronograph solar movement meaning it charges via light and never requires a battery. I like this large 44mm case with the bold bezel and high visibility dial and lume coated hands and hour markers. Overall a very nice dive watch. More of the best dive watches under 500 can be viewed here. I really love the different style of this next Citizen Promaster Altichron watch. It’s built with the adventurer in mind, the Citizen Altichron features the popular Eco-Drive technology, and adds in an altimeter, compass, and power reserve indicator. The casing is made of titanium which is hypo-allergenic, stronger and lighter than stainless steel. I think the use of titanium for watches is a great decision especially for this type of watch. It’s a large watch with a 50mm casing size along with a 16mm which makes it a little chunky too. One more important aspect would be the water resistance rating at 200m which is very good. 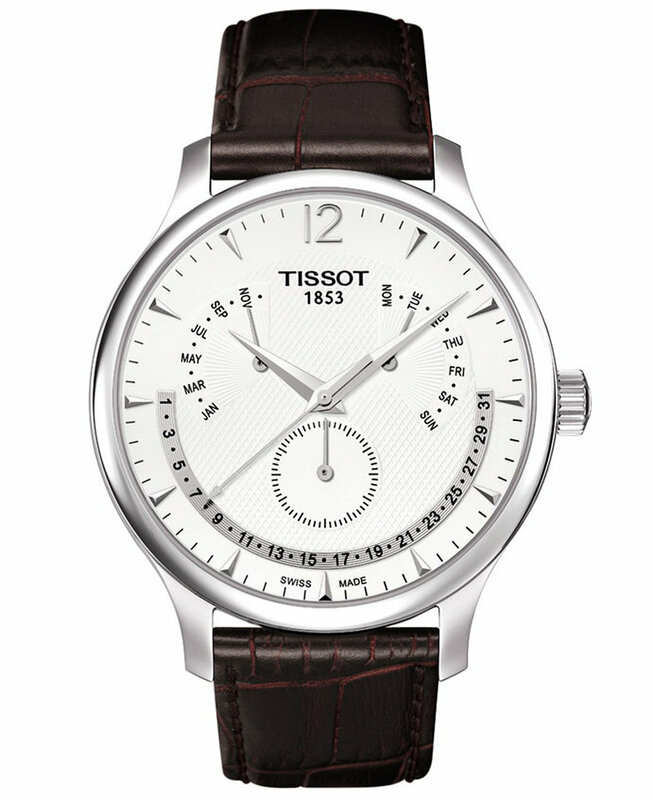 Tissot make some of my favourite dress watches. This perpetual calendar watch has a very traditional feel to it. A perpetual calendar watch automatically adjusts the date for the varying amount of days in each month, including leap years, the next time you’ll have to update it is in the year 2100. As you’d expect from a Swiss made watch it features a high quality Swiss made quartz movement as well as tough sapphire crystal glass. This next beautiful timepiece is a Seiko Prospex GMT watch. A GMT watch gives you the ability to easily view the time in a different time zone. 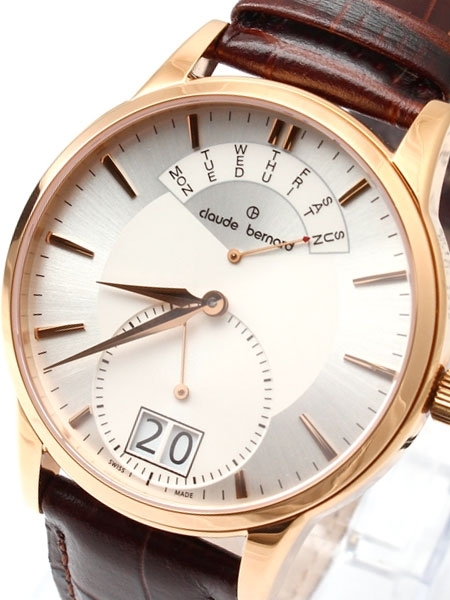 It features an additional hand and a 24 hour format around the dial. 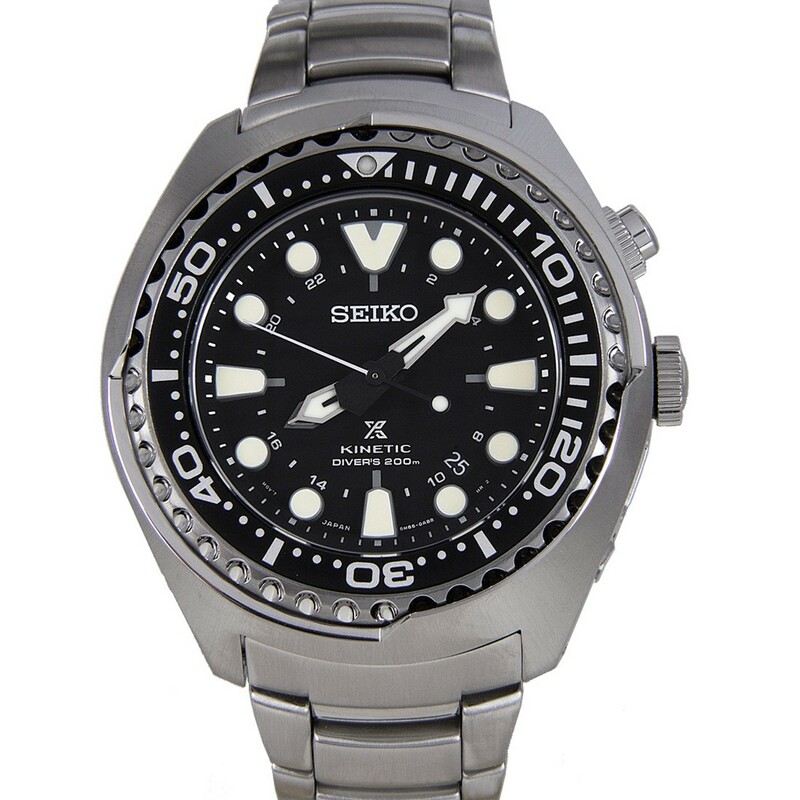 This premium Seiko Diver runs on a Kinetic movement, this movement is a blend between automatic and quartz. It uses a pendulum to rotate and charge up a battery which in turn runs a quartz. This allows you to gain the benefit of a watch that never needs a battery charge, but also has a much longer power reserve than a traditional automatic movement. 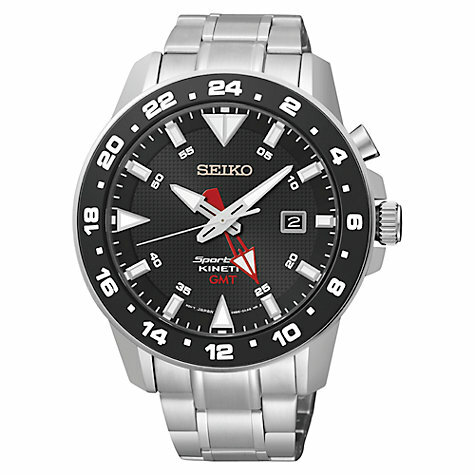 The Seiko GMT Diver has a oversized design with a 48mm casing diameter and 16mm thickness. The dial has a high visibility setting and includes Lumibrite 3d markers and hands for a really good glow. 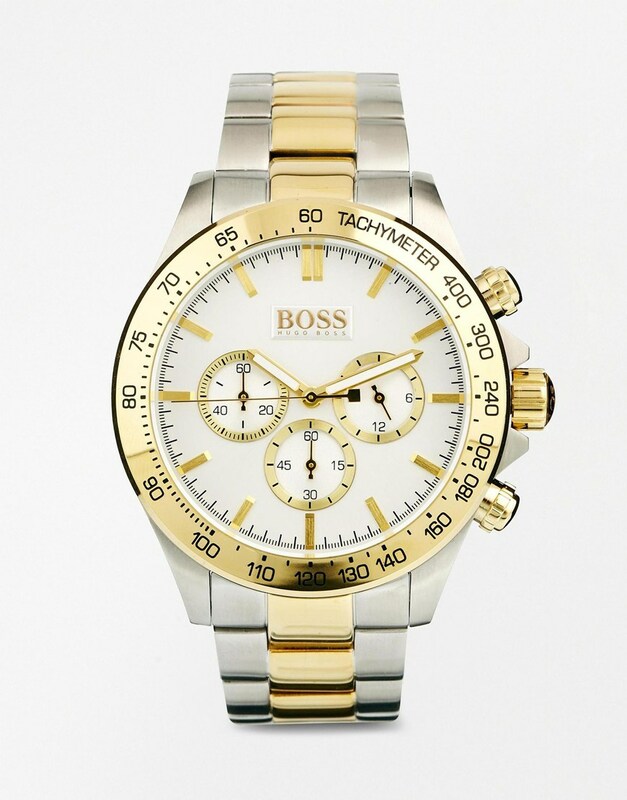 This next fantastic designer watch from Boss, Hugo Boss is an Aeroline chronogrpah. Honestly the picture doesn’t do this model justice so I recommend looking it up for some extra photos. 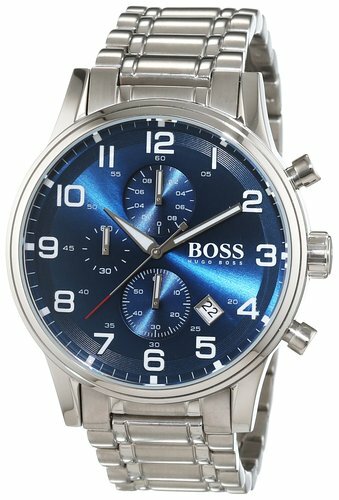 I’m a massive fan of Hugo Boss watches, I appreciate that specs wise they aren’t on the same level as other watches in this price range, but I just love their designs. 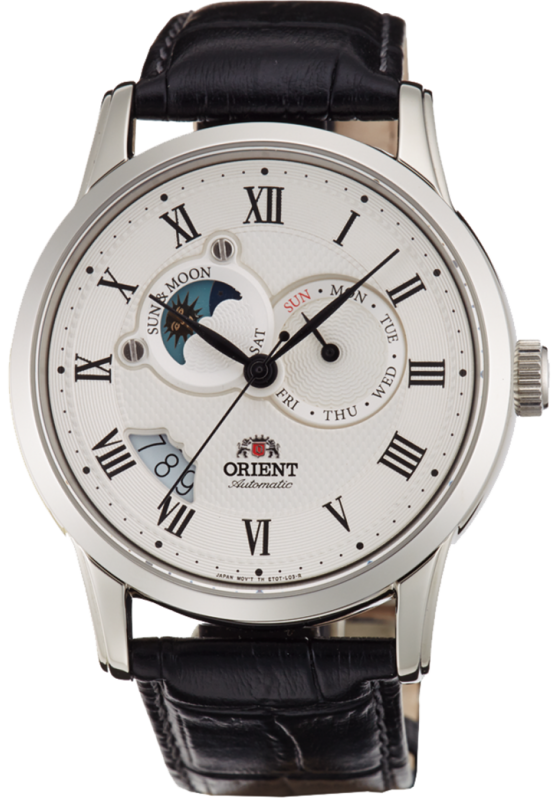 This model has a nice large blue dial with these high contrast easy to read white numerals. It has a 50m water resistance rating and runs on a reliable quartz movement. 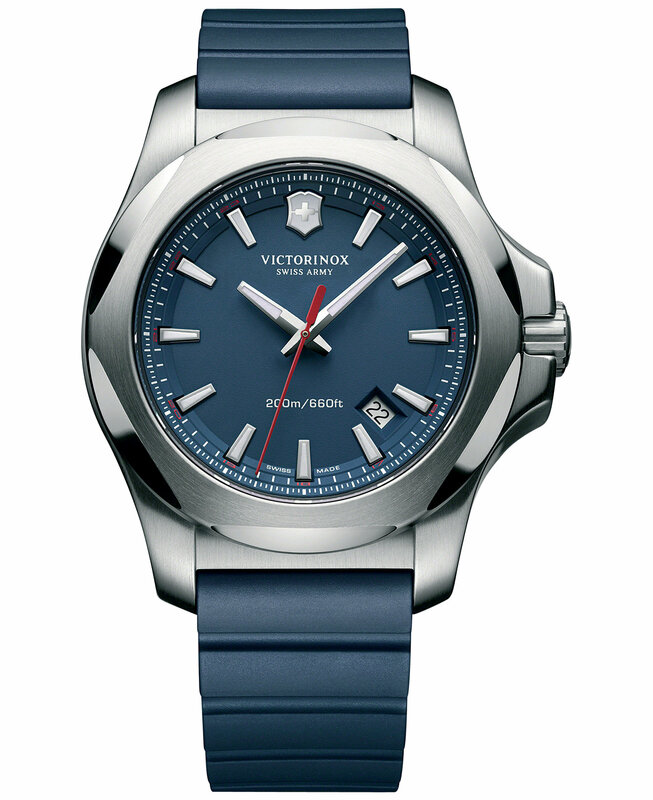 Victorinox Swiss Army make some brilliant affordable watches. They’re well built and are one of the best brands when it comes to value for money in my opinion. This Swiss Army Infantry watch has a very traditional smaller casing diameter at just 32mm with an 11mm thickness. You don’t often find gents watches in this size so if you’re specifically after a small men’s watch, then I’d consider this one, especially considering the build quality. The watch is powered by a Swiss automatic movement and is fitted with a sapphire crystal glass for excellent scratch resistance. It’s a Swiss made watch with a very good 100m water resistance rating, ideal for most peoples needs. 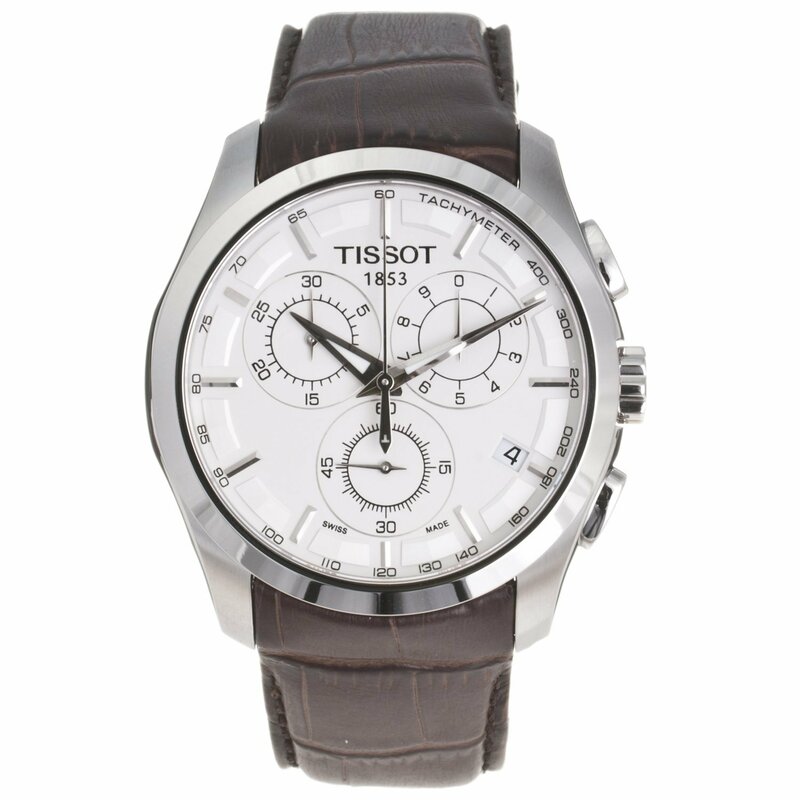 Here we have another popular chronograph watch from Tissot’s Couturier collection. This is idea for someone looking for a watch that’s suitable for both formal or casual occasions. The Swiss made Tissot has a nice bit chronograph display that’s really nice to read with its monochrome finish. The genuine leather strap features a deployment style clasp, I love this type of clasp of leather watches. 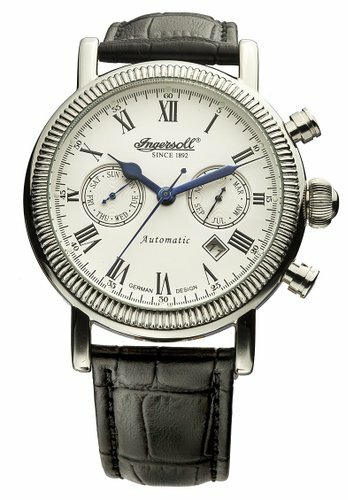 Ingersoll watches feature this interesting German design that might be of some peoples interest. Ingersoll are well known for their stylish, reliable designs. This model runs on a 35 jewel automatic movement that can be viewed via the keyhole on the dial, or through the exhibition caseback at the rear. I like the design of the sub dials that display the day of the week and month of the year, with the date nicely fitted into the centre. A very stylish looking watch to be fair. Frederique Constant are a luxury Swiss watch brand that have a passion for design and innovation. They’re a relatively new brand to be honest, launching their first collection back in 1992, but since then they’ve continued to grow in popularity. 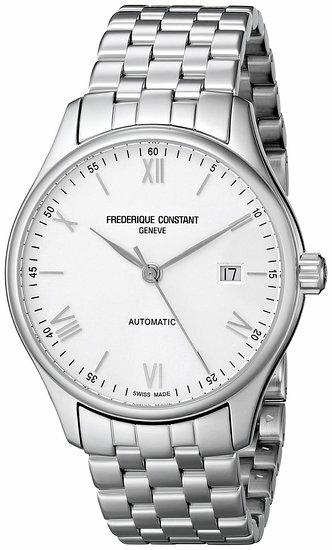 The Index Slim by Frederique Constant is a Swiss automatic watch that features a simple classic style dial design. The hands and numerals have a slim design to them – hence the Index slim name. The watch is powered by a Swiss automatic movement and has a 50m water resistance rating. There’s also an anti-reflective coated sapphire crystal glass for excellent scratch resistance. 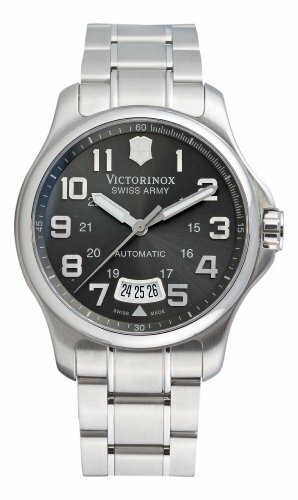 Next up we’ve got another Infantry watch from Victorinox Swiss Army. It’s a bit of a colour variant of the previous Victorinox Swiss Army watch that I featured. Personally, I prefer this style, I’m more a fan of tan coloured leather straps myself. The hands and hour markers are coated in a good amount of lume for easier reading at night. 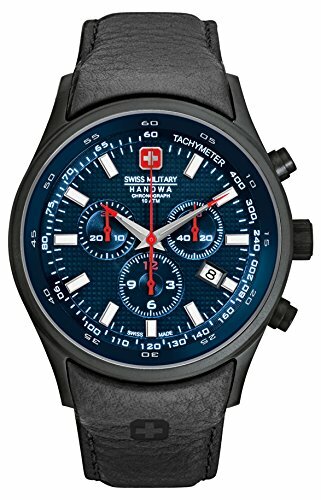 Extra features of this Swiss Army watch include a Swiss automatic movement and a sapphire crystal glass. This is a special edition watch from Jorg Gray. The Ben Spies chronograph watch has this brilliant chunky design and features lots of little blue accents that add a nice addition of colour. 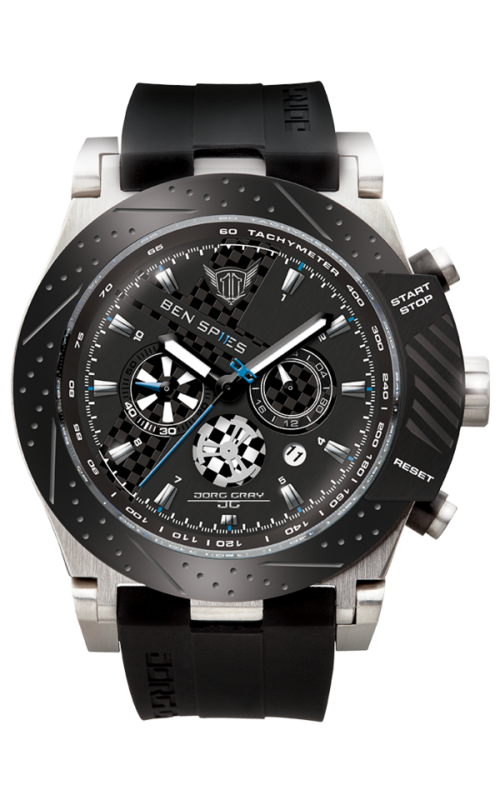 Each watch features Ben Spies signature and limited edition serial number on the reverse of the case. I really like this chequered effect on the chronograph windows too. The watch itself has a 50mm casing diameter with a 14mm thickness making this a large face watch. It runs off of a quartz movement and has a decent 100m water resistance rating. 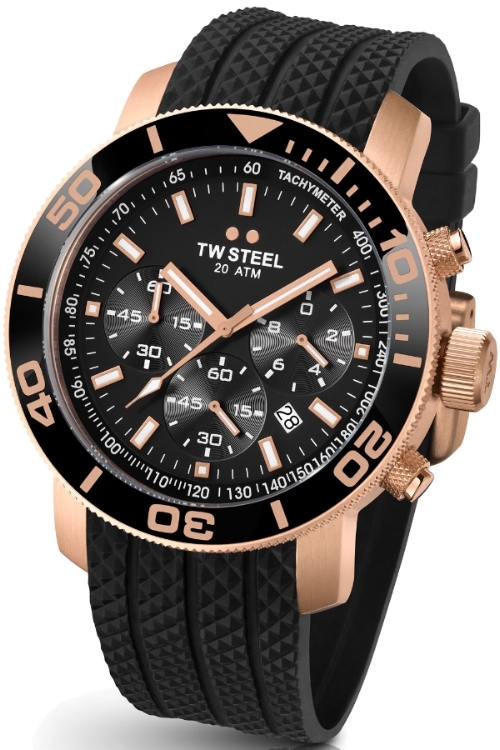 Next up we have a diver watch from TW Steel. The Grandeur Diver is an oversized watch with a 48mm casing diameter. It features a very large casing that’s complimented by the thick and sturdy silicone rubber strap, I had to add that I like the look of the detailing on this strap too. The watch runs on a reliable Japanese chronograph movement and has a 200m water resistance rating. 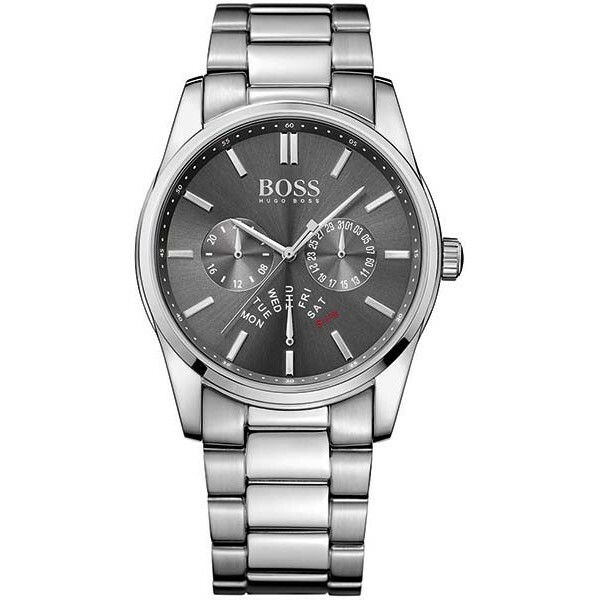 This is another affordable designer watch for under £500 from Hugo Boss. The Hugo Boss Heritage watch features quite an interesting dial in my opinion. I love the use of the day display at the 6 o’clock position. 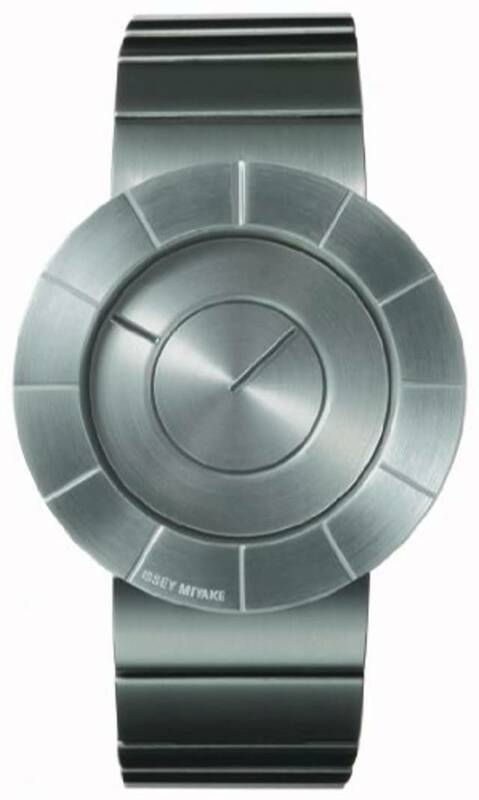 It’s quite a elegant watch with a mixture of brushed and polished stainless steel for the casing and bracelet. The watch itself runs on a quartz movement and has a 30m water resistance rating. This next superb PRS516 Tissot watch has a very stylish design with that standout vibrant red seconds hand. 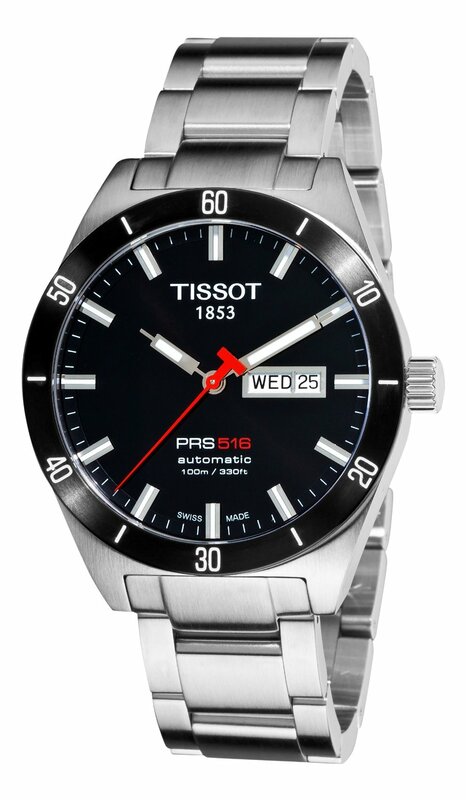 The PRS 516 collection has remained a popular choice for Tissot watch fans. It features a high quality Swiss made automatic movement along with a 100m water resistance rating and sapphire crystal glass. All great specifications that you’d expect to find in a luxury Swiss made watch. This is another huge watch from Invicta with a 54mm casing diameter and 22mm thickness, that’s one extremely chunky watch. Well if big watches are your thing, then this could really be up your street. 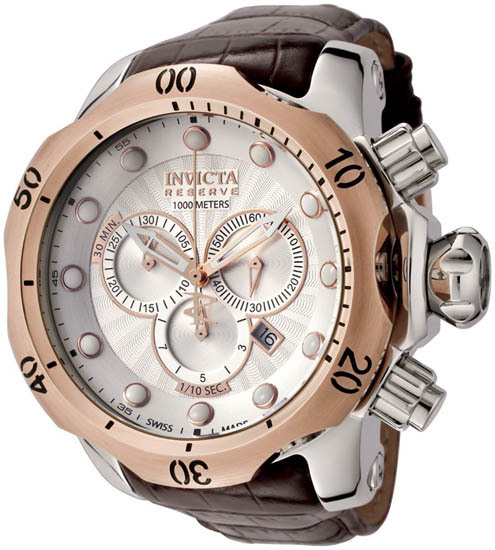 The watch is part of Invicta’s Swiss made collection, their higher end timepieces. It runs on a Swiss quartz movement and has a mineral crystal glass. Here we have a modern ceramic watch for under £500 from Emporio Armani. 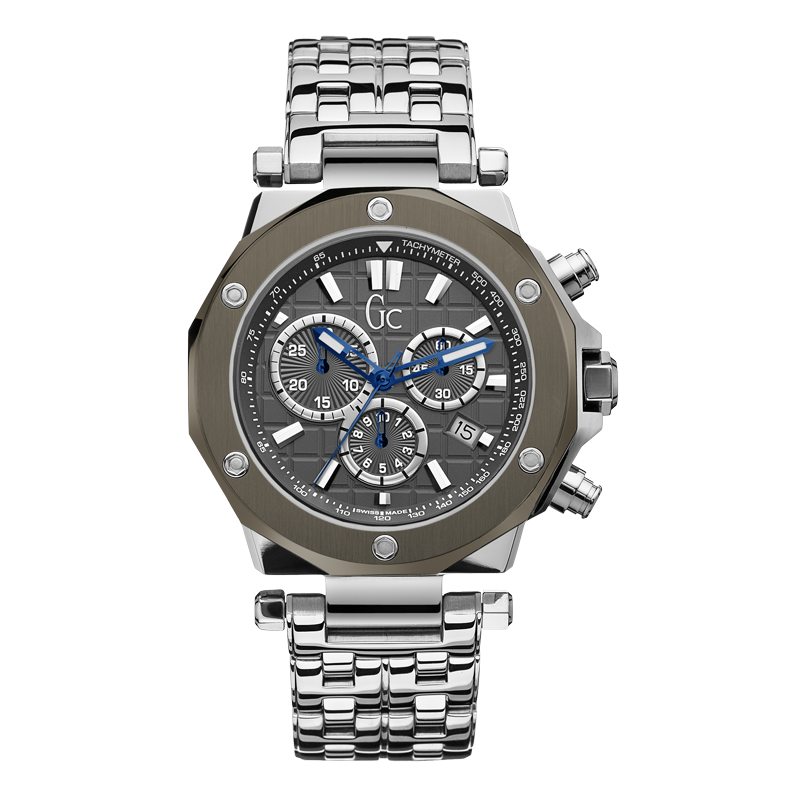 This ceramic chronograph watch has been a favourite Armani timepiece for those looking for classic yet stylish design. The trendy watch features high visibility silver Roman numerals as well as lume coated hands to make it easy to read at night. I’m a fan of the deployment style clasp that the watch features too. 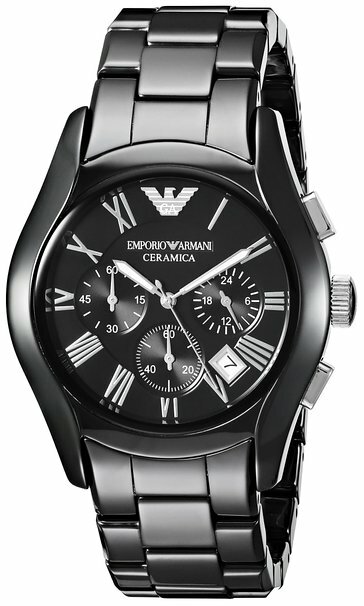 If you’re after a designer ceramic watch, you really can’t go far wrong with the Emporio Armani Ceramica collection. It’s no suprise to me that we’d end up seeing another Victorinox Swiss Army watch in this list today, they just make so many quality watches. 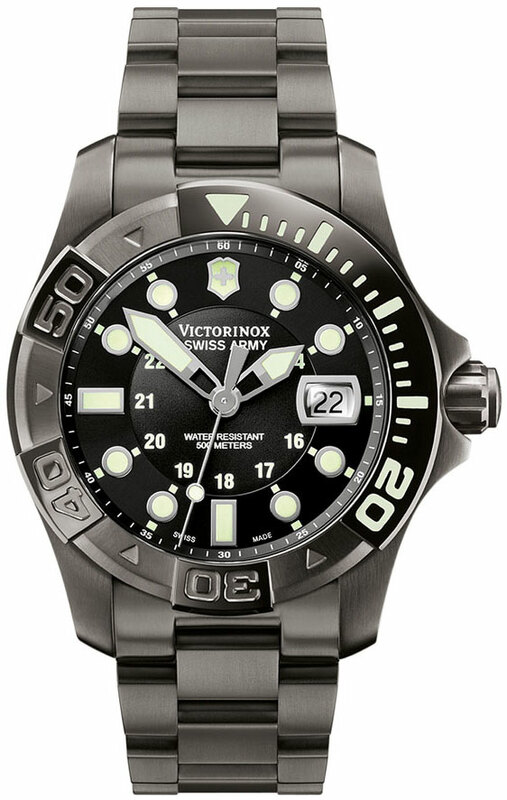 This is the Victorinox Swiss Army Divemaster 500. 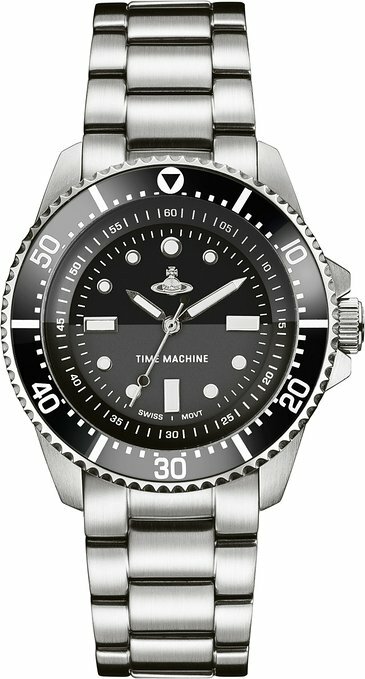 This is an extremely functional dive watch with many great specifications. The case and bracelet is finished in this beautiful Black Ice PVD stainless steel and has a very impressive 500m water resistance rating, including the scew down crown and case back. The dial itself has a high visibility display with the bold hands and hour markers, both coated in a generous amount of lume. The glass protecting the dial is made of sapphire crystal including an anti-reflective coating. And powering the watch is a Swiss quartz movement. As you’d expect to find with most serious dive watches, the Divermaster has a double locking deployment clasp with a diver’s extension to fit over a wetsuit. 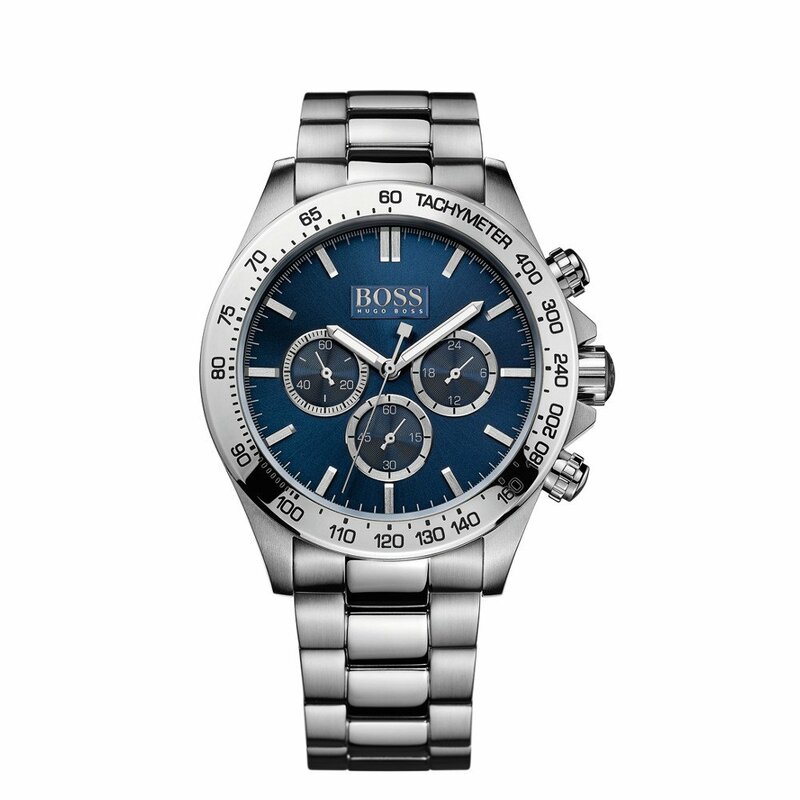 One of the best selling Hugo Boss watches under £500 is the men’s Ikon chronograph. The Hugo Boss Ikon happens to be one of my favourite designs of theirs. I think the two tone finish on this watch is brilliantly done, give it a real luxury finish. The PVD gold plating on the bezel and detailing of the dial is really striking. The watch runs on a reliable quartz movement and has a pretty decent 100m water resistance rating. As far as designer watches go, definitely worth checking out. If you’re unaware of Bulova’s popular Accutron II watches that I promise you, you’re missing out on something. The Bulova Lobster as it’s known is named so due to the casing design, you may have also heard of the Seiko Lobster. Accutron watches are mostly known for their extremely accurate quartz movements. The high perforamance quartz found inside this watch vibrates eight times higher than a standard quartz and is accurate to within seconds per year. If you’re looking for high quality quartz accuracy, this collecting needs looking at. 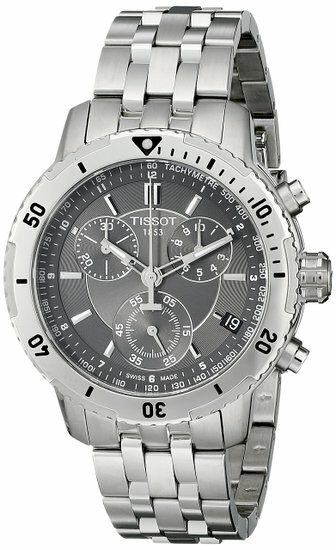 Another popular Swiss chronograph watch is the Tissot PRS 200. 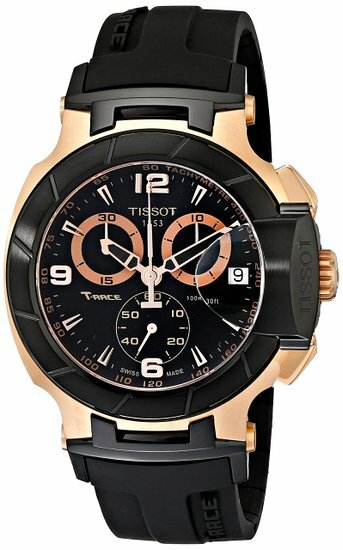 The Tissot PRS200 has a chic black face with a large chronograph display. I like the brushed and polished stainless steel strap, that two tone sort of finish works very nicely. The watch itself is powered by a brilliant Swiss quartz movement, has a sapphire crystal glass, and a 200m water resistance rating. Tw Steel have another prominent watch in this list. The Tissot Kivanc Edition features this chunky PVD rose gold plating stainless steel case with a gorgeous blue genuine leather strap that really makes the watch stand out. The numerals hour markers are bold making them fairly easy to read on the dial too. The Kivanc is powered by a precise Miyota OS20 quartz chronograph movement, and has a 100m water resistance rating. The glass is also extra scratch resistant being made of sapphire crystal. Another great choice for those who like bold watches. This is a very traditional timepiece with a rectangular watch face. You don’t see a whole lot of rectangular watches under £500 in this list as they just aren’t as popular as other designs, that being said I thought it was good to get a few in here as I know some people prefer this style. 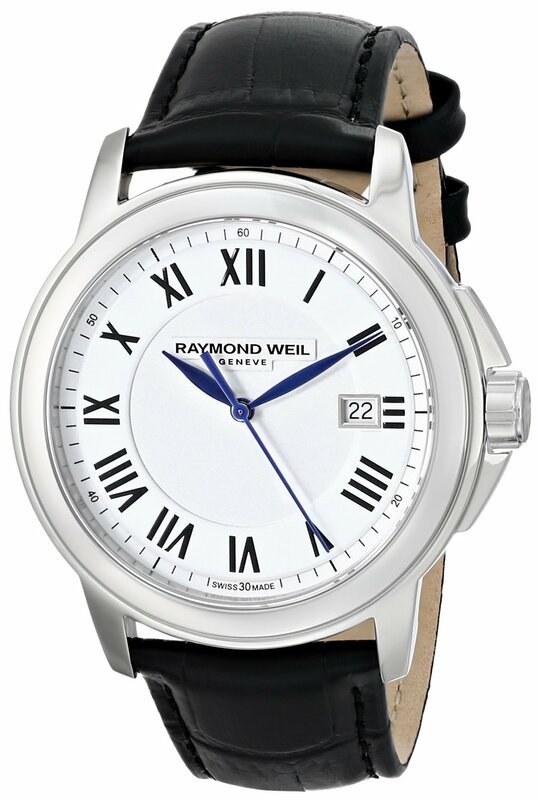 This Swiss made watch from Raymond Weil has an attractive classic style to it with a simple dial design including a small date display at the 3 o’clock position. The watch is powered by a Swiss quartz movement and has a sapphire crystal glass protecting the dial. 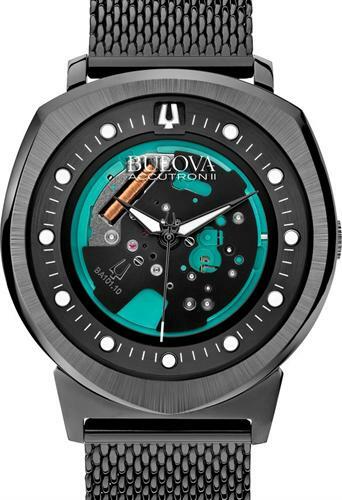 Next up we have another brilliant watch from Bulova’s incredible UHF Precisionist collection. The Precisionist watches features an ultra high frequency quartz movement that vibrates up to 8 times faster than a traditional quartz watch movement. This makes the watch very accurate to within seconds a year and gives the watch a nice sweeping seconds hand. I quite like the overall dial design with the way the chronograph sub dials are spaced out and the blue accents that add a little dash of colour to the watch. 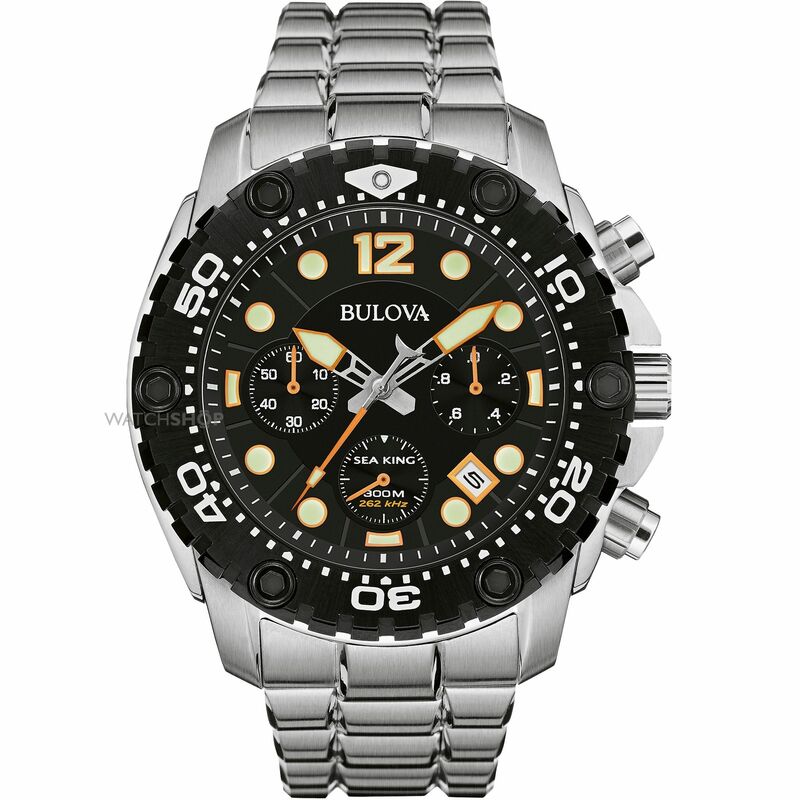 This Bulova watch also has a really good 300m water resistance rating. Great if you’re after looking for highly accurate watches. 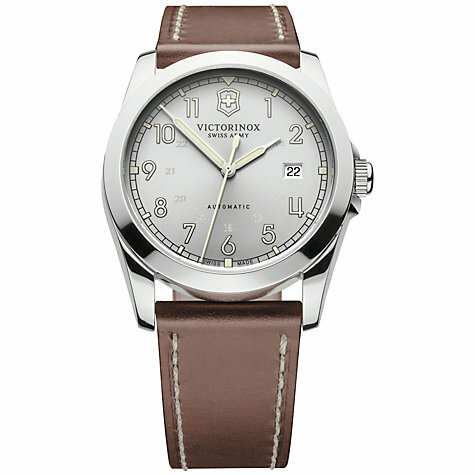 Another one of the best automatic watches under £500 is this Victorinox Swiss Army timepiece. The Victroinox Infantry watch features a large easy to read display with these bold numerals and hands that are coated with a good amount of lume. The watch runs on a quality Swiss automatic movement and has a sapphire crystal glass protecting the dial. I like the vintage style to it with the soft genuine leather strap and black ice guilloche colouring. The Gravity Defier Casio G-Shock is next on our list that includes some of the best digital watches under £500. This watch features a high contrast black dial with yellow detailing as well as a negative LCD display. This is definitely classed as a highly functional dual display watch. It features an intuitive layout with Casio’s Tough Solar technology that means the watch is powered by light and never requires a battery. It also uses the multi-band 6 radio controlled timekeeping for extreme accuracy. Extra features also include a perpetual calendar, dual time display with 26 world cities, 24 hour digital chronograph, countdown timer, and 5 daily alarms. 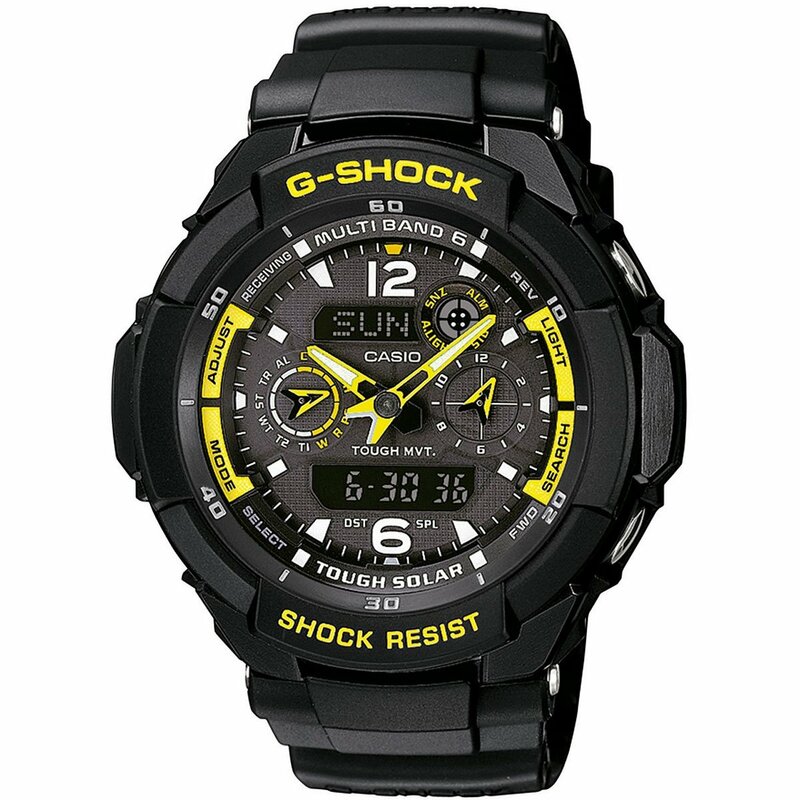 As you find with a lot of G-Shock watches it has this oversized chunky design with a 50mm diameter and 16mm thickness. Last but not least is the 200m water resistance rating. All in all an incredibly high functioning durable watch. This monster from Invicta is incredibly eye catching. The watch a has a huge 51mm casing with a 20mm thickness, mainly due to that oversized bezel that stands out in the design. 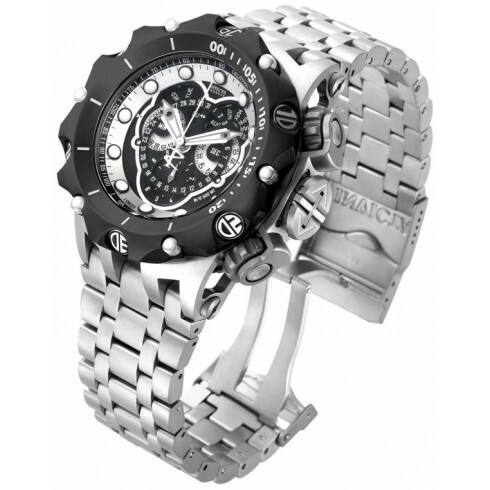 It’s a very masculine watch from Invicta, the strap is ultra wide at 31mm too. The watch itself runs on a Swiss Ronda quartz movement that offers accurate timekeeping as well as being very reliable. If you’re after a large watch that’s bound to get noticed on your wrist, do check this one out. The next watch we have featured is the Braun Prestige Chronograph. The dial of this Braun watch has an easy to read layout, the white numerals stand out nicely against the black background, as do the high visibility watch hands. It’s great to feature more watches with rubber straps, a lot of people prefer them to stainless steel or leather so I’m glad this Braun watch made the cut. It runs on a accurate quartz movement and has a sapphire crystal glass too. This watch from Braun has actually won quite a few design awards too which is an interesting little fact to point out. Here we have another best selling watch for under £500. 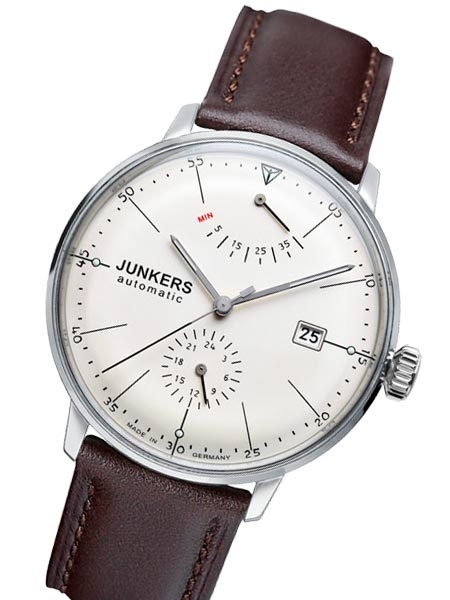 The Junkers Bauhaus is a renowned watch which has a lot of respect from the watch community. It’s a brilliant German made watch that’s powered by an automatic movement with a power reserve indicator on the dial. Speaking of the dial, I love the design to this piece, the 24 hour sub dial at the 6 o’clock position as well as the date at the 3 o’clock simply look great. A great German automatic watch from Junkers. This is a really interesting timepiece for those that like to go for something different with their watch designs. It’s a very sleek elegant watch that uses a quartz movement to run the two eye catching rings of this timepiece. If you wanted something eye catching, then Issey Miyake has certainly provided that. 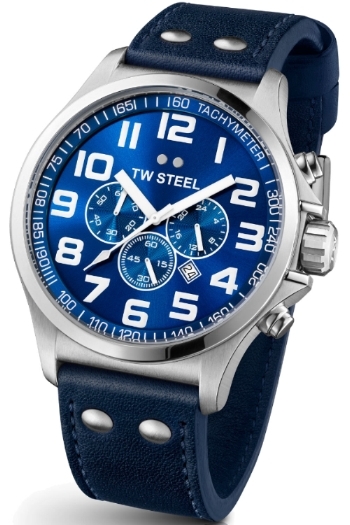 Next up we have another oversized TW Steel watch. I like the cut of the bezel, it gives it this great detailing that really makes it stand out. Of course there’s also that huge frown on display too. This TW watch has a 50mm casing diameter and runs on a Miyota 6S20 Japanese movement. The mineral glass crystal that protects the dial is reinforced with a sapphire layer for extra scratch protection too. 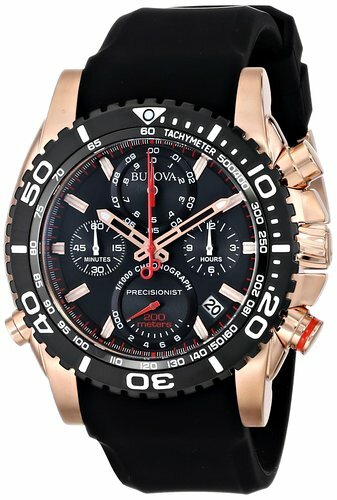 It’s no surprise to see yet another Bulova UHF Precisionist watch. If you’re after highly accurate watches for under £500, then the Precisionist series is the way to go. For those that haven’t read the descriptions on the previous UHF watches, the quartz movement beats up to 8 times faster than a standard movement, making it accurate to within a few seconds per year, and giving it this lovely sweeping seconds hand movement. I love the bold design of this particular model. The rose gold PVD plating blends really well with the black bezel and dial design. Up next we have another one of my favourite PVD rose gold watches from Hugo Boss. 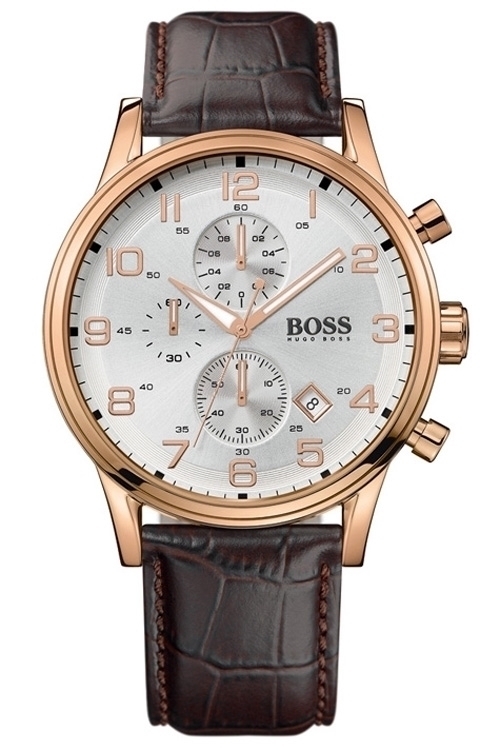 This Boss timepiece focuses on stylish design with its light coloured dial and rose gold detailing. The chronograph sub dials are set out really nicely and allow ample room the the Boss insignia. This model features a reliable quartz movement as well as a 50m water resistance rating. Here we have a sports watch from Tissot, you’re instantly greeted by the bright red silicone rubber strap that’s a prominent feature of this watch. Tissot of course known for their luxury Swiss made watches, this model runs on a Swiss quartz movement, has an anti-reflective crystal, and a 100m water resistance rating. 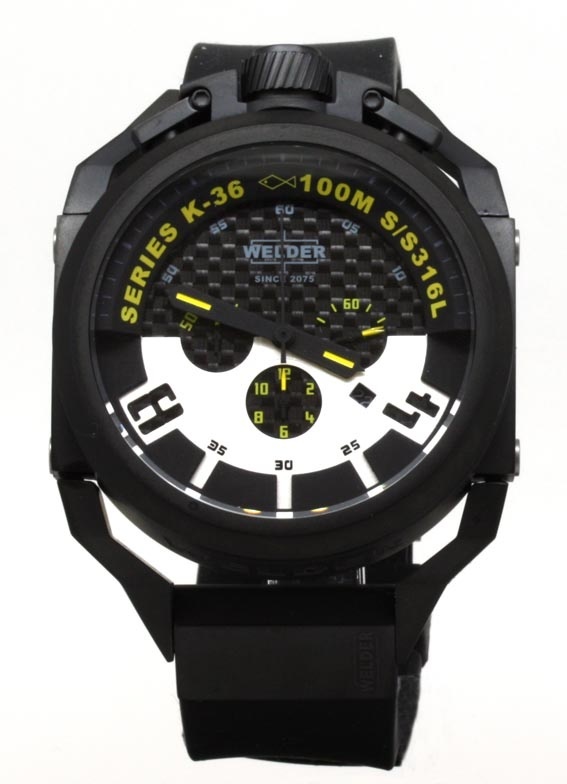 Welder are another brand known for their oversized watches under £500. I’ve featured the brand before on this site and showcased quite a few of their brilliant large watch designs. This particular model is created by the same designer of the U-Boat watches, it’s easy to spot the similarities now right? The casing diameter is 50mm with a thickness of 17mm makings this a chunky timepiece indeed. It’s backed up by a reliable quartz movement and 100m water resistance rating. Great for those who like bigger watches. 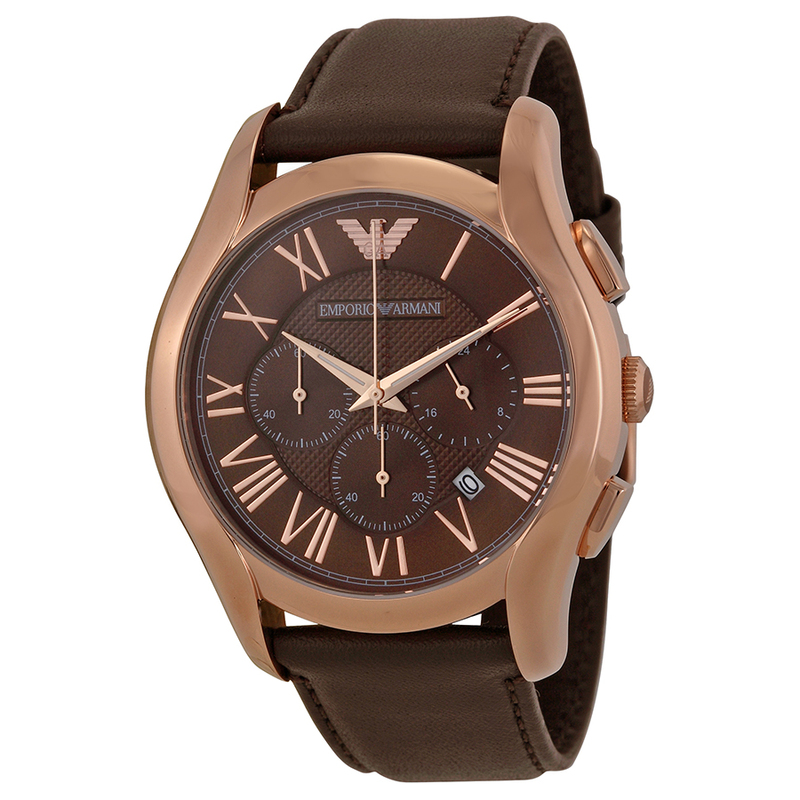 Emporio Armani have a really nice range of stylish chronograph watches available. This model has great blend of PVD rose gold plating with chocolate coloured dial and genuine leather strap. It runs on a Japanese quartz movement with a pretty basic 30m water resistance rating. 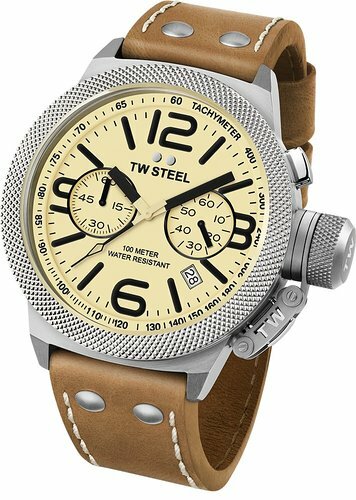 This next TW Steel pilot watch has this brilliant high visibility dial with these high contrast numerals and watch hands. It features a very large watch casing diameter at 50mm with a thickness of 13mm. So whilst it was large it wasn’t actually that chunky, so sits on the wrist nicely. This model includes a chronograph, date display, and tachymeter. It’s worth checking out my list of the best pilot watches too. This next edition is a Accurist analogue/digital dual display watch. Accurist are probably most well known for thier affordable watches but this timepiece in particular is a little bit higher end. It’s a robust multi-functional pilot style watch that runs on a quartz movement with a 100m water resistance rating. Guess make some of the coolest watches under £500, this model simply looks incredible, I love the bold design with that awesome looking bezel and the blue detailing for the watch hands. If you’re looking for an eye catching watch then it’s certainly worth looking into this model. 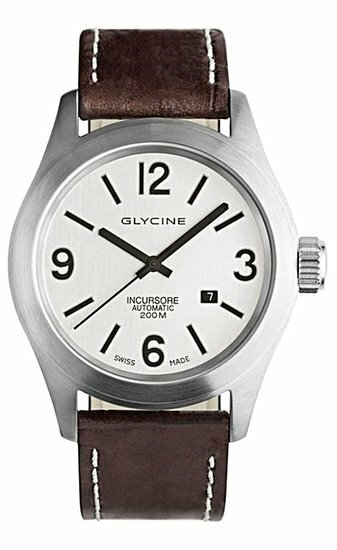 Glycine are another really well known Swiss watch brand that start to pop up a lot around this price range. This Swiss made watch features a brilliant sandblasted stainless steel casing that’s complimented with a vintage style strap. It runs on a popular ETA 2824-2 Swiss 25 jewel automatic movement that has a 38 hour power reserve. All in all it’s a very classic looking watch with some luxury specifications to back it up. 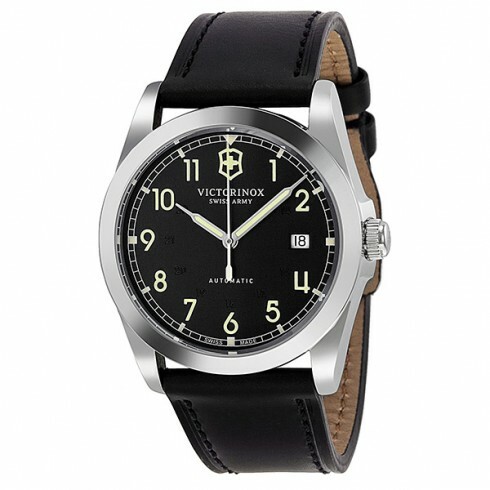 Victroinox have done it yet again with their Swiss Army watches. This watch runs on a popular Swiss ETA automatic movement making it very accurate and reliable at the same time. I love the gun metal coloured dial as well as the design of the date display exposing a day either side. The dial has high visibility in mind with the large numerals and bold, lume coated watch hands. As for water resistance, it’s pretty good with a 100m rating. This Seiko Sportura is ideal for those looking for the best GMT watches under £500. 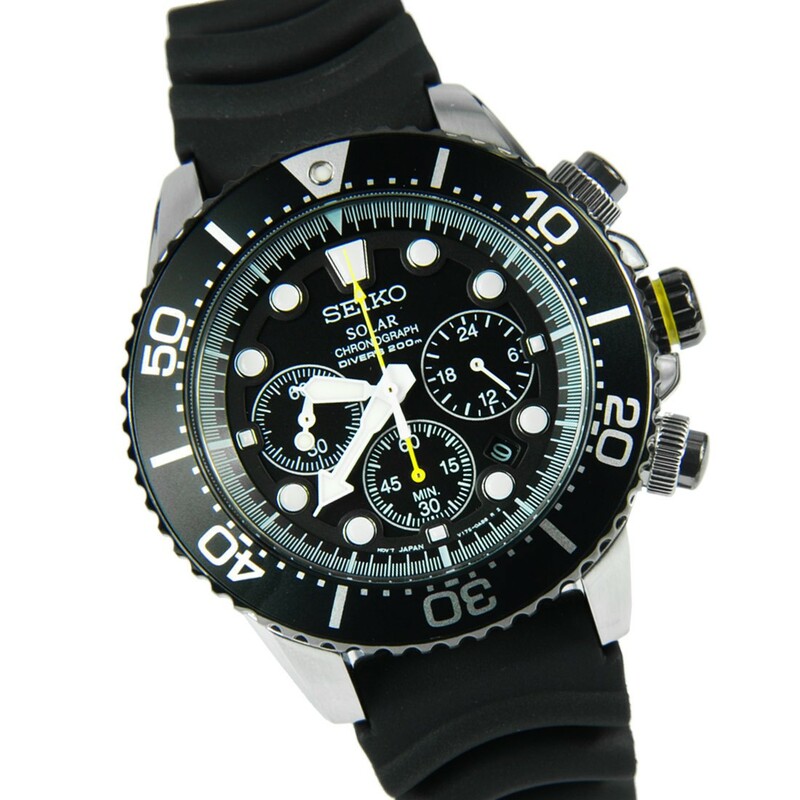 The Seiko Sportura is a best selling watch for Seiko and is very popular in the watch community. The watch runs on Seiko’s kinetic movement, which means it charges up like an automatic, but stores the power on a battery to then run a quartz movement. You get the benefit of never needing to change the battery, as well as a very good power reserve, sometimes months worth. The GMT complications allows you to view two different time zones at once using the separate red hand and the 24 hour display that’s printed onto the bezel. At number 60 we have another Seiko Solar watch. 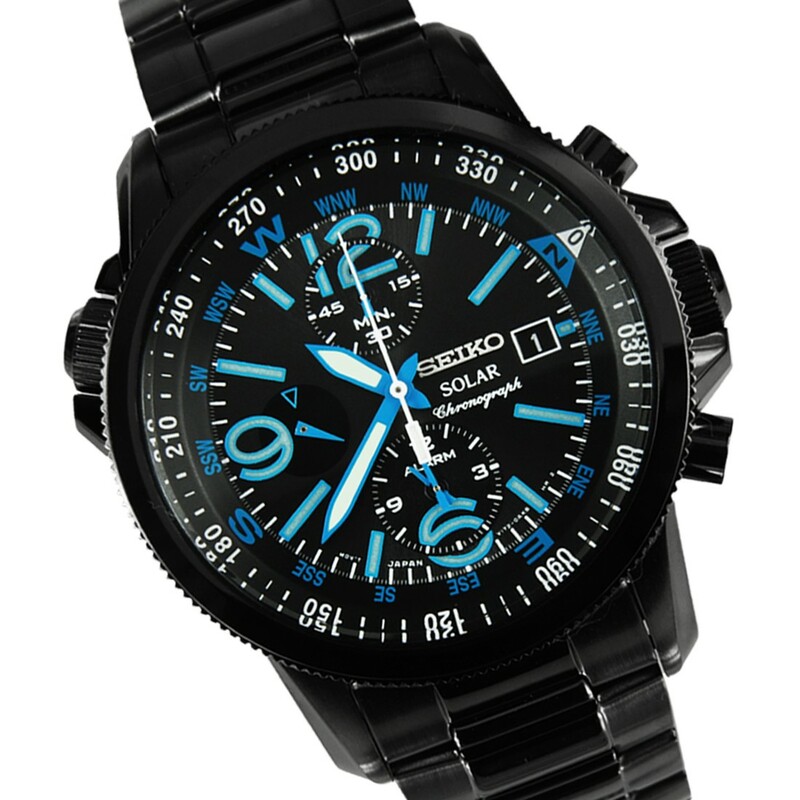 This is a very stylish looking watch with the primary black design and blue multi shade detailing on the dial. The watch runs on a solar powered quartz V172 movement, it’s powered by light so it never needs a battery. The hands are coated in Lumibrite for excellent visibility at night too. 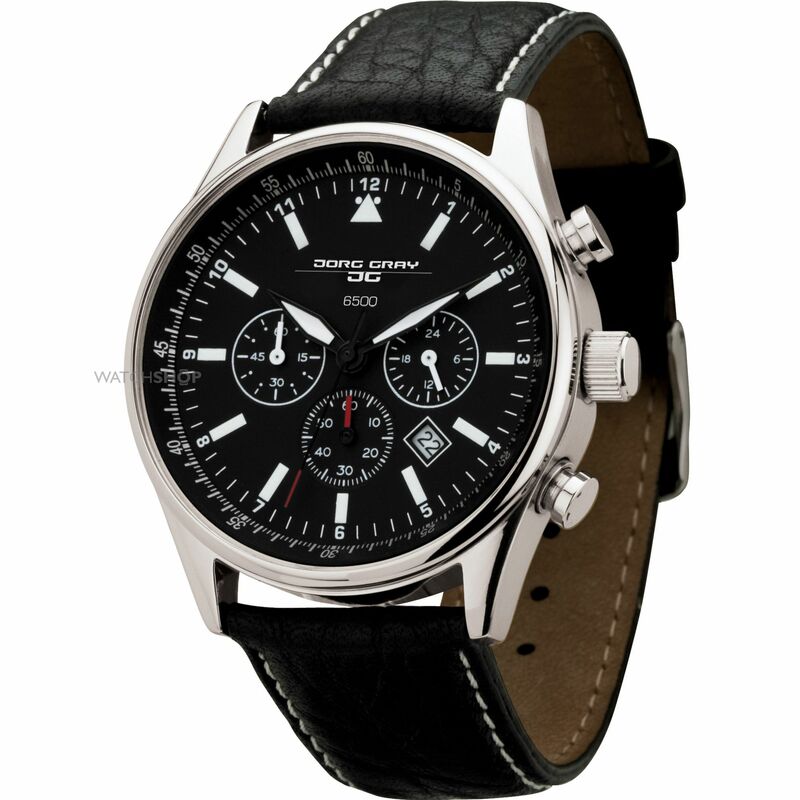 The chronograph watch has an alarm, stop watch, and inner rotating compass bezel. 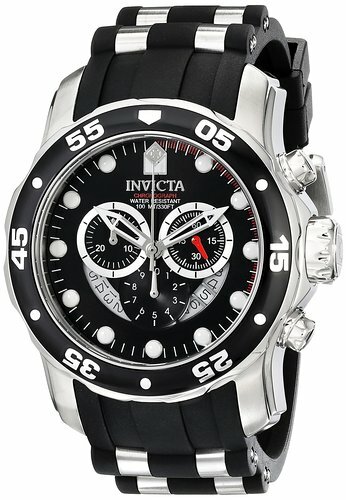 The Invicta 9937Ob is a very popular timepiece for this brand from their Pro Diver collection. 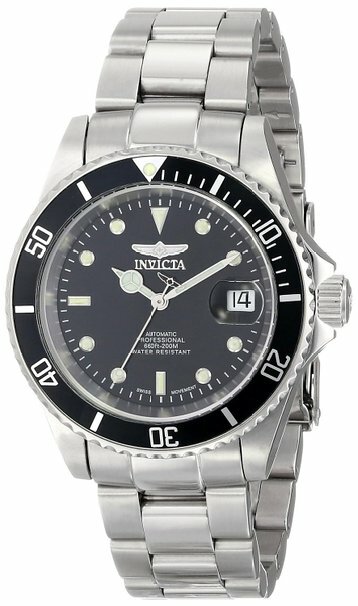 The automatic watch features Invicta’s Flame Fusion crystal that I’ve heard a lot of good things about, I recommend checking out some of the forums to get your own opinion on it. The hands and hour markers have a good amount of lume making them very visible in dim lit conditions too. The watch itself runs on a Swiss automatic movement and has a 200m water resistance rating. It’s also worth checking out the best dive watches here. 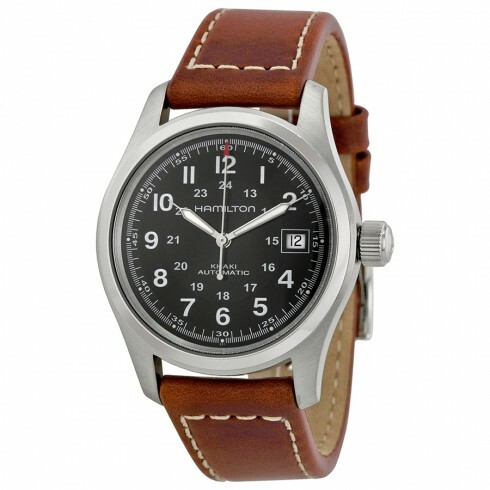 The Hamilton Khaki automatic field watch has quite a following online. It’s one of Hamilton’s best selling Swiss made watches and runs on a Swiss automatic movement with a 100m water resistance rating. The watch has a vintage military look to it but features a exhibition caseback so you can view the ETA 2824 movement at work. 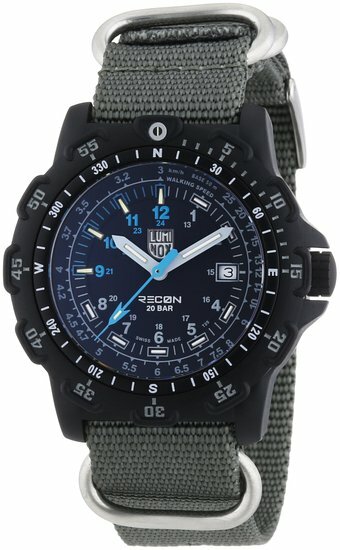 I love the design of this Luminox Recon watch. I really like this oversized bezel as well as the blue detailing on the dial. There are gas filled tubes at the hour markers that provide great luminosity that’s a key feature of Luminox watches. If you’re after a fabric strap watch with a serious build quality, then this Luminox watch is worth considering. Diesel are another brand known for their oversized watches. This model has a 57mm casing diameter with a 13.5mm thickness. So whilst it isn’t overly chunky, the watch face itself is huge. 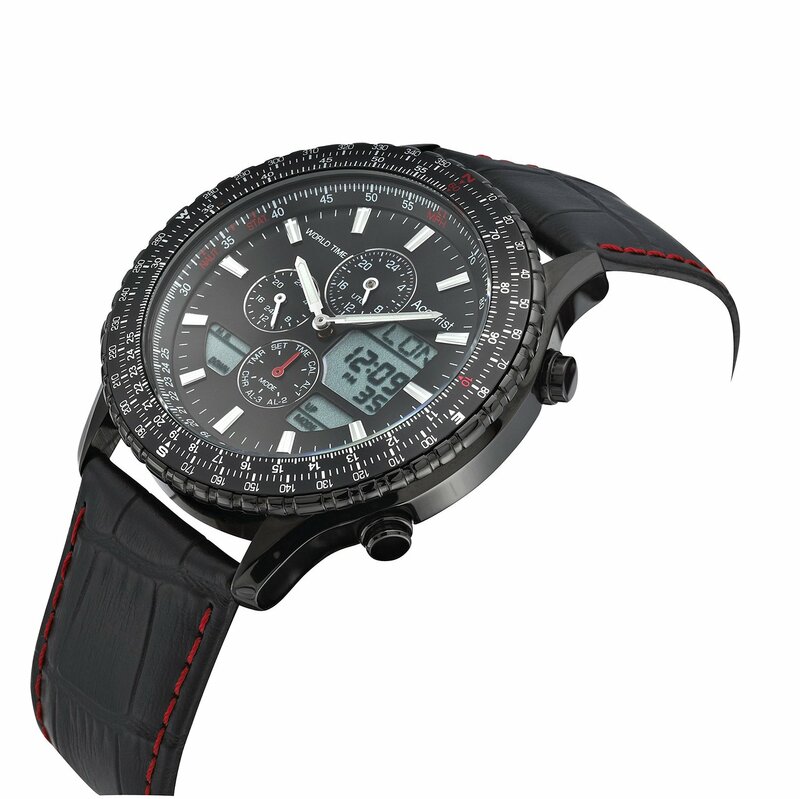 The chronograph features include a stop watch with 1/1 sec to 30 mins. A 24 hour display and date display. The hands are highly polished with luminescent tips for extra visibility at night. Up next from Thomas Earnshaw we have this very affordable automatic watch. 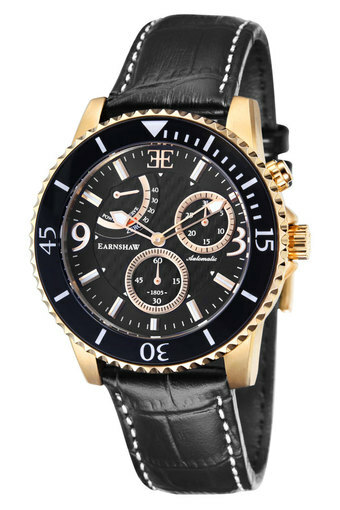 The Thomas Earnshaw Admiral automatic features thie great black and gold design that’s very popular at the moment. I’ve recently been sent a Thomas Earnshaw watch and have been really pleased with the overall quality of their watches. This model has a self winding automatic movement, sapphire crystal glass, 50m water resistance rating, and an exhibition caseback on display. When it comes to the best Swiss watches under £500, it’s clear that Victorinox Swiss Army watches would dominate the list. They’re a favourite brand in Switzerland most notably known for the production of the Swiss Army Knife. The Swiss quartz movement of this watch is housed in a sturdy Acciaio INOX case and features a anti-reflective sapphire crystal glass for excellent scratch resistance. 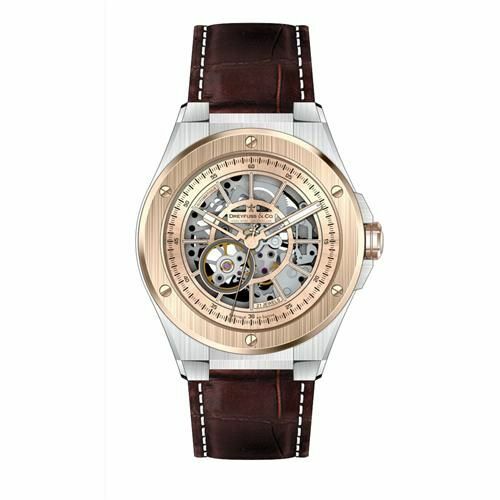 This handsome looking Rotary Jura Skeleton watch is made from two-tone steel with a rose gold PVD plating. 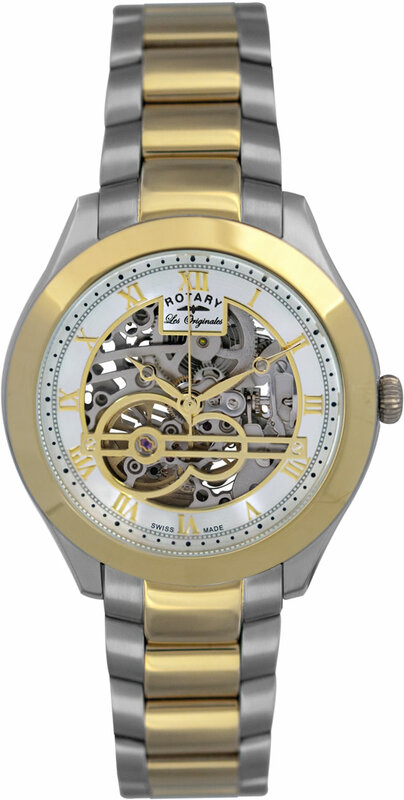 The Rotary Les Originales are a selection of Swiss made automatic watches. This model has a striking skeleton dial that showcase the 21 jewel automatic movement. As you’d expect from Rotary’s higher end watches, this model has a sapphire crystal glass protecting the dial too. Rotary makes many of the best affordable skeleton watches available. 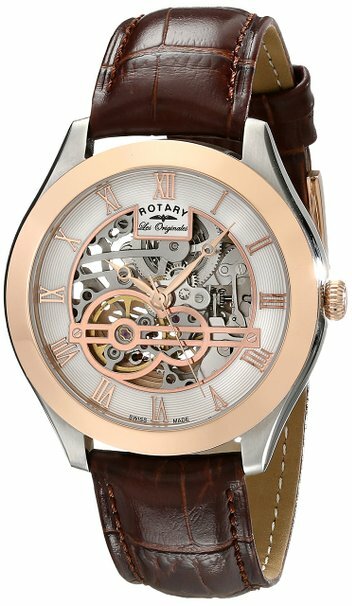 Similar to the previous watch, this is another Rotary Les Originales Jura skeleton watch. 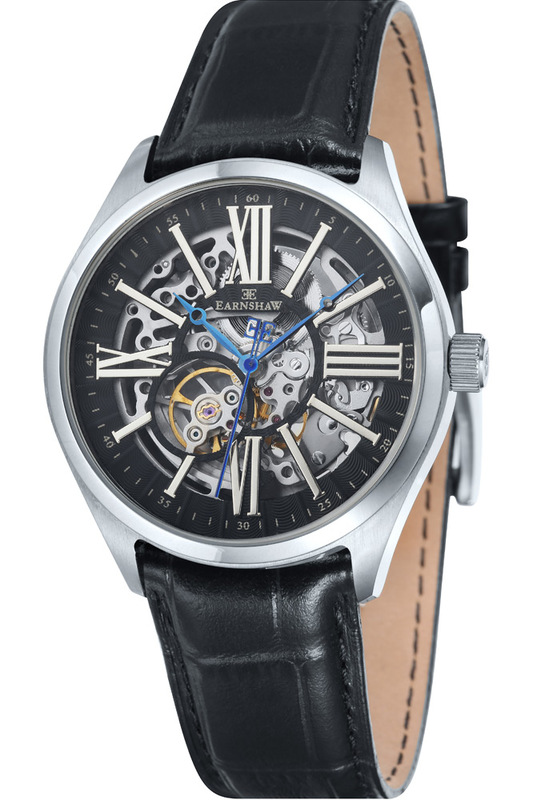 Another one of the best skeleton watches under £500 in my opinion. The GB90515/10 has a 21 jewel Swiss automatic movement on show that can be viewed through the skeleton dial, or the exhibition caseback. The watch also has a 100m water resistance rating and a sapphire crystal glass. 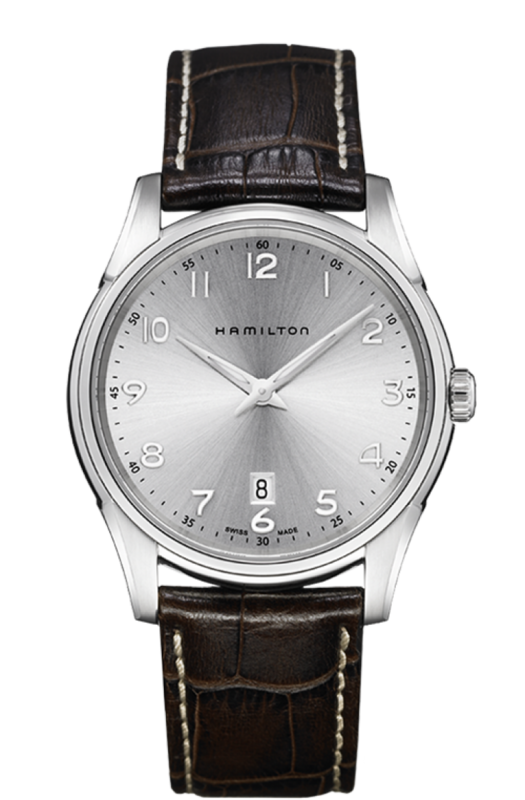 Here we have another popular Hamilton watch, the Jazzmaster Thinline. It’s a wonderful slim watch with an 8mm thickness that sits really nicely on your wrist. This Hamilton watch has a nice sunray silver dial which adds a nice aspect to the design. It runs on a Swiss quartz movement and has a 50m water resistance rating. Overall a great watch for day to day wear. The Citizen Shadowhawk is another great chronograph watch for under £500. It features that popular Eco-Drive technology that’s already features so many times in this list. Never needing a battery change and charging from any form of light was always going to be a great feature. I love this two tone design the the rose gold PVD detailing on the bezel, strap, pushers, and crown. The hour markers and hands also come with a good coating of lume too. 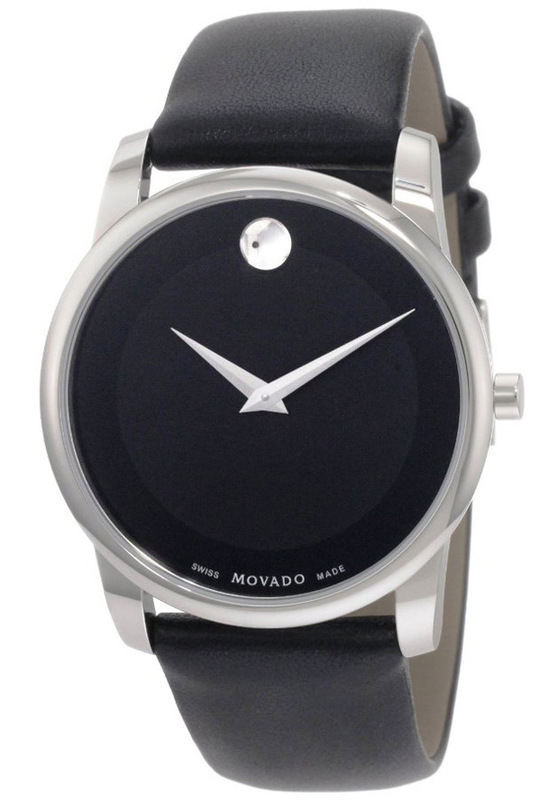 This Swiss made watch is from Movado, a brand best known for having the only timepiece ever to be selected for a permanent place in New York’s Museum of Modern Art. The simple yet elegant design of this watch is its primary feature. The watch itself runs on a Swiss quartz movement and has a sapphire crystal glass and basic water resistance. This is ideal for those looking for an interesting unique looking watch, with an interesting back story. 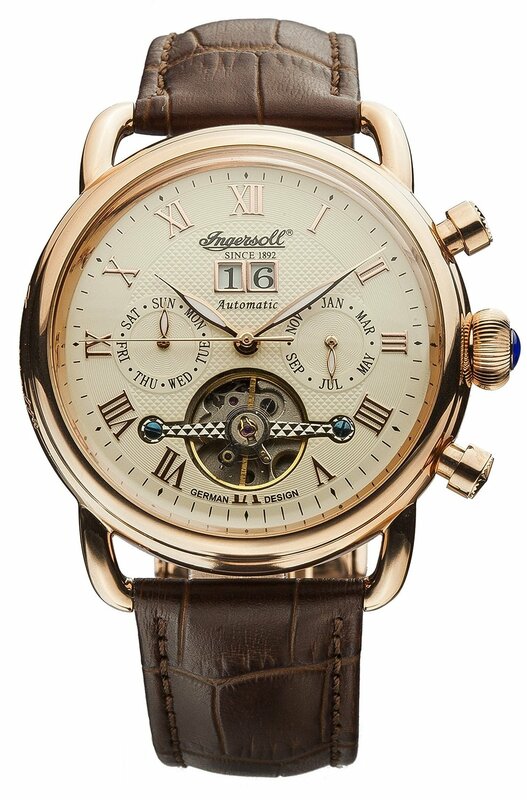 Up next we have another popular Ingersoll watch. The German designed watch runs on a automatic movement and has a standard mineral crystal lens. I quite like the vintage style of the Roman numerals around the dial, as well as these two spaced out sub dials displaying the day and month of the year. A high end watch from Seiko’s Premier Kinetic collection. The watch runs on Seiko’s clever Kinetic movement, it charges up via the movement of your wrist, then uses this to power a quartz movement. If left unworn for 24 hours it will go into a sleep mode to conserve power, but the moment you pick it back up, it will jump to the correct time. Of course it also features a sturdy sapphire glass, 100m water resistance rating, and a perpetual calendar. This is a classic looking automatic watch from Bulova’s Accu-Swiss collection. The Tellaro watch has an elegant, classic watchmaking feel to it. It runs off a Swiss automatic watch and features a sapphire crystal glass. I love the design of the crown on this model, very nice indeed. 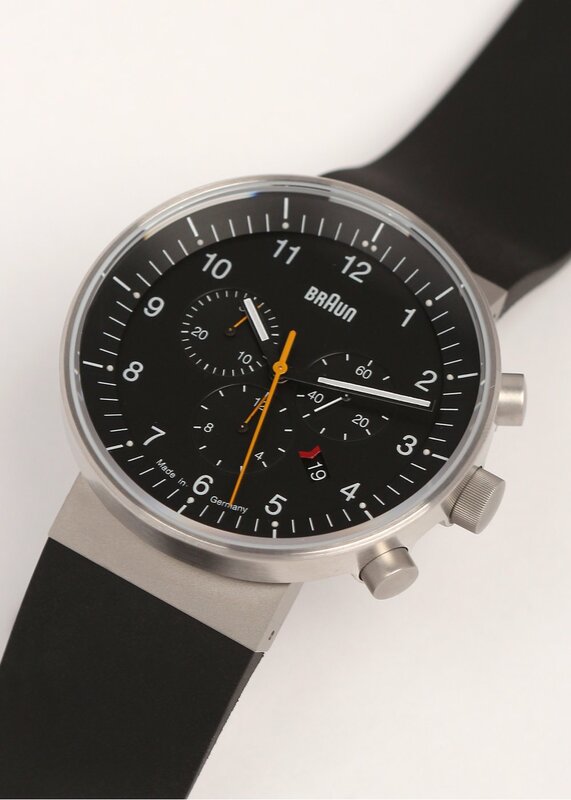 Again we have another affordable Swiss Military Hanowa watch. 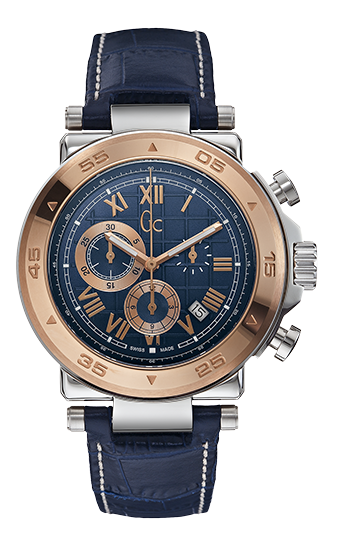 The Navalus Chrono chronograph watch has this beautiful texturing on the blue stand out dial that adds an extra sense of style to it. The casing has a black Ion plating and measures 46mm in diameter with a 13mm thickness. The watch itself runs on a Swiss quartz movement and has a 100m water resistance rating and sapphire crystal glass. 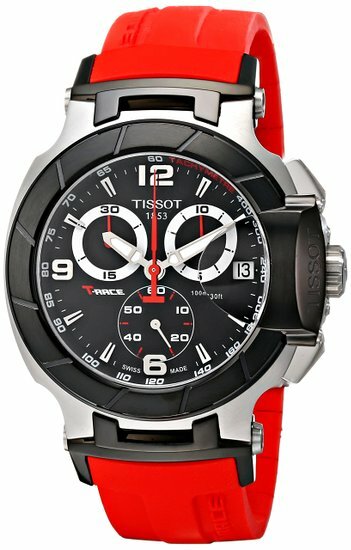 Here we have another popular Tissot T-Race Chronograph watch. It’s a nice chunky looking watch with that popular PVD plated rose gold and black style. The T-Race Tissot watch runs on a Swiss made quartz movement, has a sapphire crystal glass, and a 100m water resistance rating. 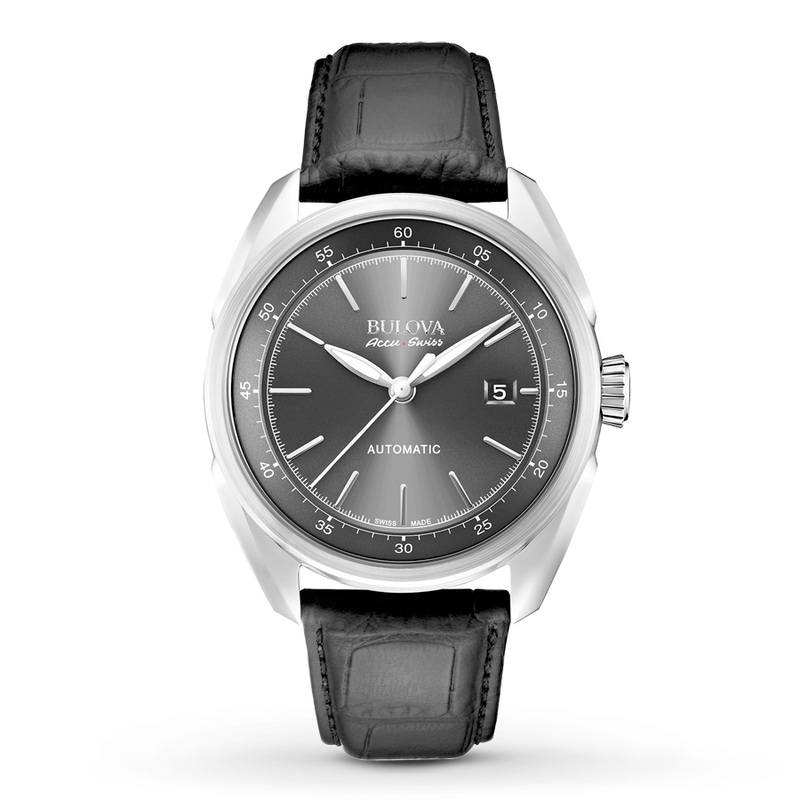 This is another brilliant UHF watch for under £500 from Bulova. The Sea King UHF is made of stainless steel and fitted with one of Bulova’s UHF movements. These ultra high frequency movements are extremely accurate with a quartz vibrating at a frequency of 262 kHz. This gives you that signature sweeping hand that the Bulova UHF watches are well known for. The watch is large and chunky giving you that reassuring feel. It has a 300m water resistance rating which is great to see, what I’d expect from a watch named Sea King to be fair. 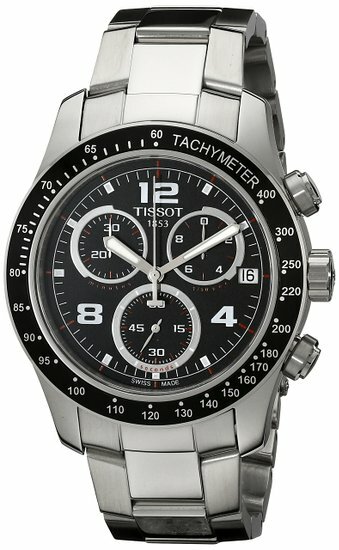 Tissot have yet again featured another classic design chronograph watch in this list. The Tissot V8 chronograph features a classic design with a stop watch function and lume coating the hands and hour markers. It runs on a Swiss made quartz and features a sapphire crystal glass and 100m water resistance rating. Another stunning timepiece from the Guess collection. The X90015G7s Gc Gc-1 glass watch has this luxurious two tone design blending the rose gold PVD bezel with the rest of the stainless steel fittings. I love this navy blue strap with the white stitching along the edges, it looks great. Not only is this a brilliant looking watch, it runs on a Swiss quartz movement, has a sapphire crystal glass, and a 100m water resistance rating. A great designer watch that’s worth getting in my opinion. Up next we have another affordable oversized watch from Invicta. This model has a large 48mm casing diameter with a 17mm thickness making it quite chunky. The strap is made of a silicone rubber with stainless steel fixtures for added sturdiness. I think the dial looks great with the semi-exposed date display being quite an interesting touch. Overall a great choice for those who like big watches. This is another one of the best GMT watches under £500. 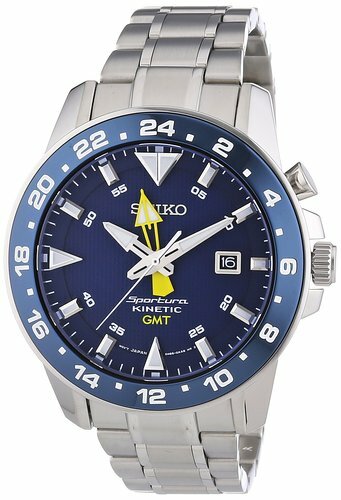 The Seiko Sportura GMT Kinetic is a high specification timepiece that offers some pretty good value for money. The watch is powered by the movement of the wearers wrist, charging up a battery to run a quartz movement. This Kinetic movement makes the watch very efficient and has a very long power reserve, some Kinetic models can last months. The Seiko Sportura also features a GMT complication to display two time zones one the dial at once using the extra yellow watch hand. Extra features include the protective sapphire glass and 100m water resistance rating. Next up we have another stylist Davosa timepiece. 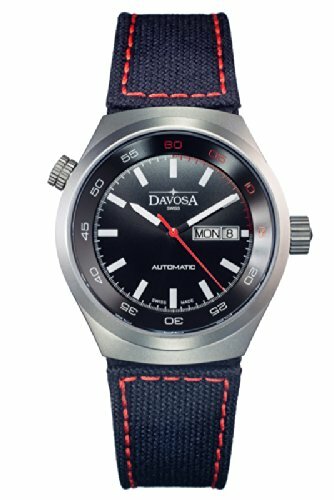 The Davosa Men’s Trailmaster automatic watch has a rather smart, straight to the point design. I really like the sense of depth on this dial, as well as the high contrasting hands and hour markers for better visibility. The watch is stylish and functional running a Swiss automatic movement and having a 100m water resistance rating. If you were looking for a style fabric strap watch, I’d give this one a chance. Hugo Boss are back again with another designer watch for our list of the best chronograph watches under £500. The watch has quite a large profile to it with a 44mm casing diameter. I like the use of an acciaio INOX case as well as the 100m water resistance rating. 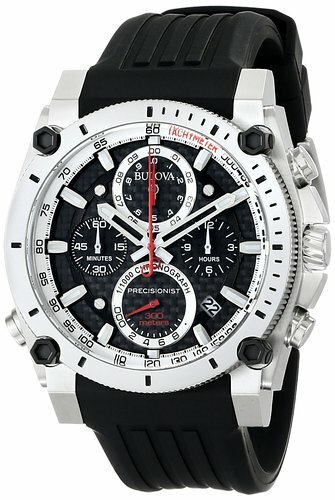 If you like larger black Ion plated watches, then maybe look into this model. Timex are known for their affordable timepiece, whilst this might not be the cheapest watch from their collection, it definitely deserves a space in today’s list. This is the Timex Indiglo Tide-Temp Compass watch. You guess it, it’s a highly functional adventure watch. 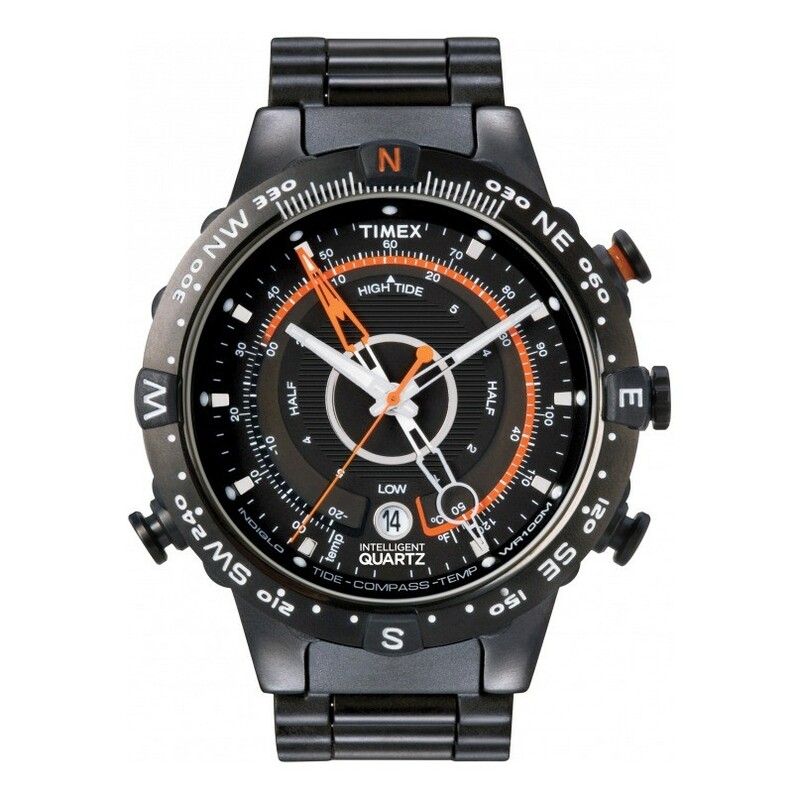 The dial features Timex’s Idiglo technology where at the click of a button, the whole display can be illuminated. There’s also the added features of a tide, temperature, and compass display. Roamer of Switzerland has another Swiss quartz watch for us to features. This brilliant dress style watch features a beautiful blend of PVD rose gold plating and plain stainless steel. I think it works extremely well with this darker genuine leather strap. 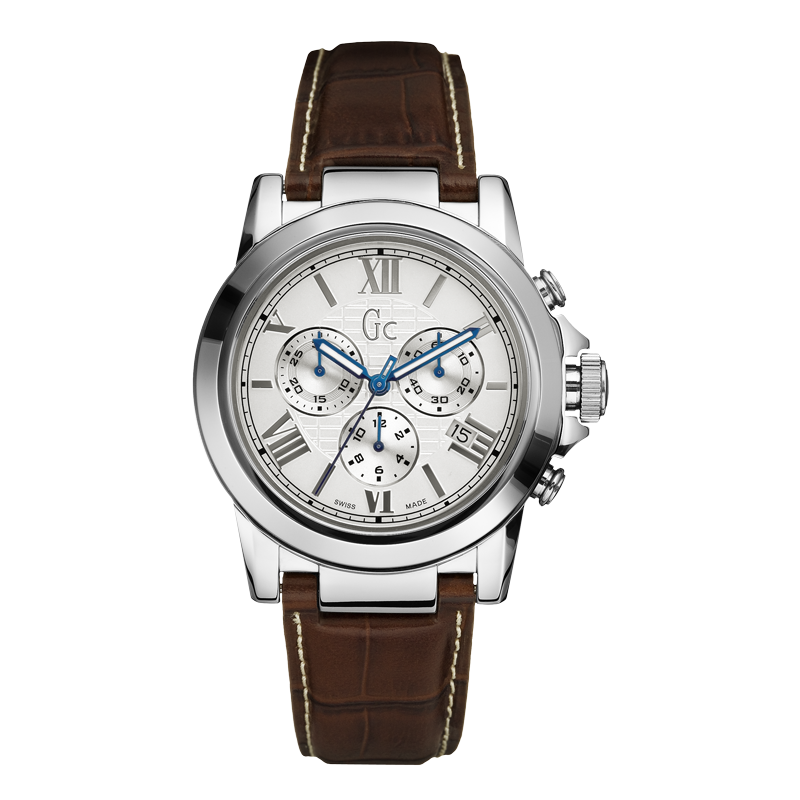 It’s a chronograph watch with a rather smart style to it. Extra features include the 50m water resistance rating and sapphire crystal glass. 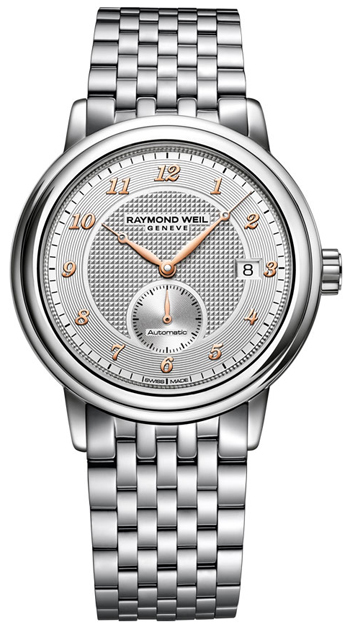 I’ve got to admit Raymond Weil watches are onf of my favourite Swiss brands. I love the classic style of this timepiece, you have the small yet bold Roman numerals around the dial, but a nice touch of colour coming in from the watch hands. It runs on a Swiss quartz movement which makes it accurate and reliable. Extra features include the sapphire crystal glass and 50m water resistance rating. 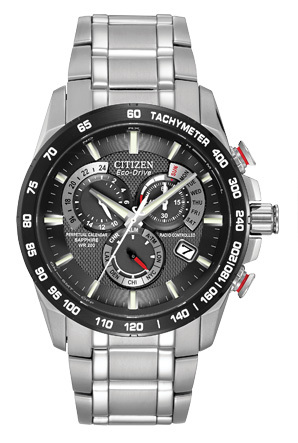 This is a great looking Eco-Drive watch from Citizen. It’s a two tone watch that features this gold PVD plating on the bezel, crown, pushes, and strap. I’ve always liked the Eco-Drive technology, it means the watch is powered by light and never requires a battery. 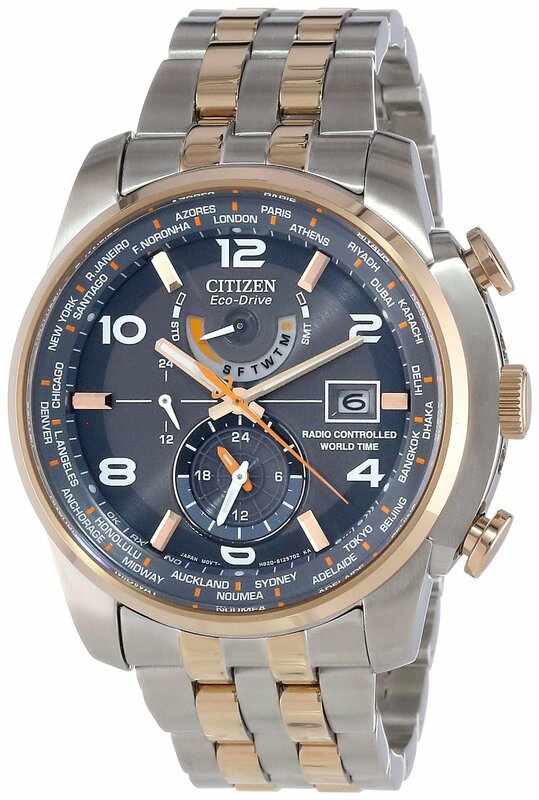 This Citizen watch also includes a perpetual calendar so you won’t have to adjust the date for the varying amount of days in each month. 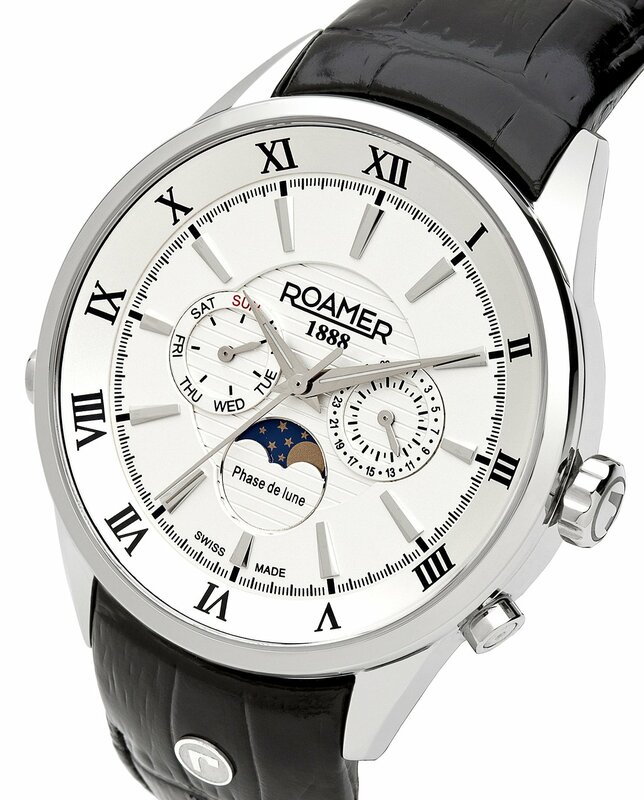 Up next I’ve got another day date watch from Roamer. 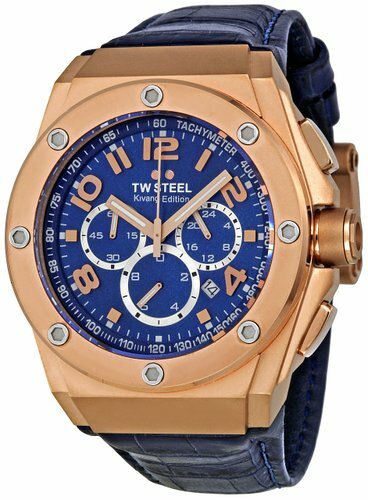 This Swiss made watch has a beautiful dial design with a mixture of texturing and rose gold detailing. 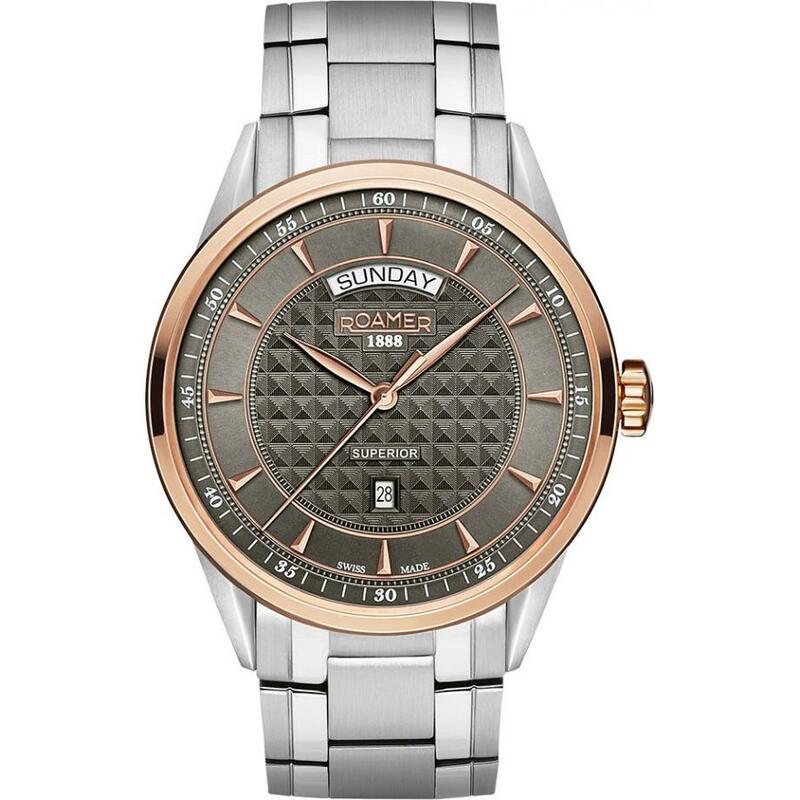 The Roamer Superior features a Swiss quartz movement as well as a sapphire glass and 50m water resistance rating. A lot of people like these day date watches, me included. Our first watch from Burberry to make it onto the list. 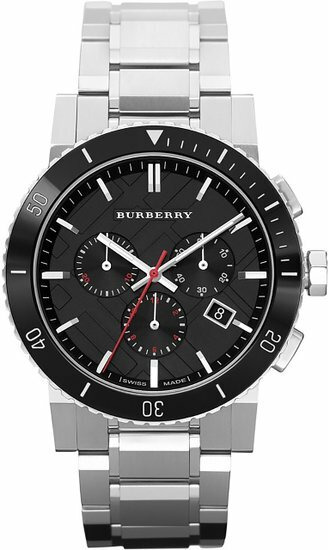 This very stylish looking Burberry watch is Swiss made and as you’d expect, is run by Swiss chronograph quartz movement. I really like the design of this dial, it’s very smart with quite a cool looking subtle pattern in the background. Seiko have another stunning watch from their Premier collection. The Seiko Premier is a Japanese automatic watch with a keyhole view on the dial and exhibition case back on the rear. I’m a big fan of genuine leather straps that use a deployment clasp like this model too. Well, congratulations on making it all the way through! 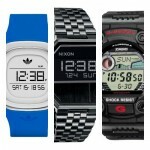 that was the Ultimate Top 100 Watches Under £500, Most Popular Best Selling Watches For Men. Let me know what you thought in the comments and please do share this on social media with your friends, it would be a great help. Make sure you subscribe to our site, we’ll have more epic top 100 posts coming soon! Thanks for coming along and enjoy your day. 7 Most Popular Timex Watches Under £100 For Men. Best Selling Timepieces. Finally took the plunge after trying tp decide for ages and have gone for that guess watch number 56. Looks sublime im so excited to get it now! I couldn’t agree more with number 1. There’s also a version of it with a muted grey/purple dial which I much prefer to the black. I bought the Ingersoll (72) from Amazon last year. But not at the £345 it is advertised for now. Brand new, not a return for £77! A couple of days later the price had gone up to £377? A typo on their part? I don’t know, but I’m very happy with it. Interesting that Hugo Boss have appeared multiple times. Watch snobs will hate them, and their specs are often poor for the price, but damn, they make fantastically designed watches indeed. Very handsome timepieces. I was looking for a watch for my boyfriend, now I have so much choice! What to get him! Seiko are one of the best watches brands under 500 there’s no doubt about that! If you really want VALUE for money, stick to Seiko. If I were to recommend the best Seiko watch under 500, I would go for a simple dress watch from the Seiko 5 collection. Which other Seiko watches would people go for? I would like to see a break down by the best watches under £500, £400, £300, £200 and £100. That way I could scroll down to my most suitable budget. You should do a list of 500 watches under 500, that would be an amazing read through don’t you think? Lately I’ve been focusing on Swiss automatic watches lately to add to my watch collection. Which Swiss watch brands under £500 would you suggest?